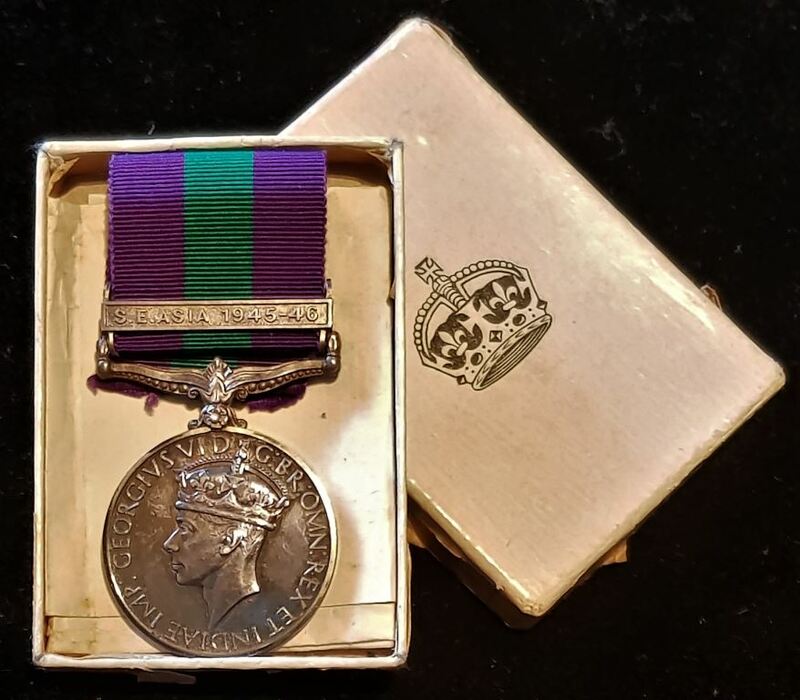 With copy Medal roll entry for Elizabeth 2 Coronation Medal and MBE recommendation as Deputy Assistant Director of Mechanical Engineering 8th Corps stating 'This officer has held the appointment of D.A.D.M.E since the early days of the Corps in February 1943. His untiring application has played a great part in the work which REME have been able to undertake. Throughout the operation from HOLLAND to SCHLESWIG he has put in a degree of work that has enabled the branch to function normally in spite of severe reductions in personnel from accidents and sickness'. Second Mentioned in Despatches was awarded commanding the 11th Infantry Brigade REME Workshop in Korea. Four: MBE, Defence Medal, GSM clasps Palestine 1945-48, Cyprus, Arabian Peninusla 4003634 AC1 CJ Domoney RAF, RAF LSGC 4003634 SGT CJ Domoney RAF. It appears Stamer Gubbins was born in New Zealand on passage to Australia in 1882. Gubbins family settled in Melbourne where he was educated at Melbourne Grammar School. Joining the 5th Contingent, Victorian Mounted Rifles in 1900 as a lieutenant at the age of 18, he served in South Africa during the Boer War. After serving his full tour with the 5th VMR he went on to serve in the Royal Fusiliers in 1902. O.B.E. London Gazette 3 June 1919. Gubbins, who was also mentioned in despatches (London Gazette 15 June 1916, refers), later served in the Egyptian Expeditionary Force as Deputy Assistant Adjutant General, services that resulted in his award of the O.B.E. After a long adventure away from Australia, Gubbins finally returned in 1938 with his wife. He died in 1940. King Friedrich Wilhelm III instituted the Iron Cross on 10 March 1813 as an award for bravery, available to all ranks, both combatant and non-combatant. By the Supreme Cabinet Order of 12 March 1815, combatants whose bravery in action had been brought to the attention of the King but had not been awarded an Iron Cross as a result, were permitted to ‘inherit’ an Iron Cross 2nd Class when, following the death of a recipient, the cross was returned. A deceased officer’s Iron Cross being awarded to another officer, in similar other rank’s crosses were awarded again to other ranks. 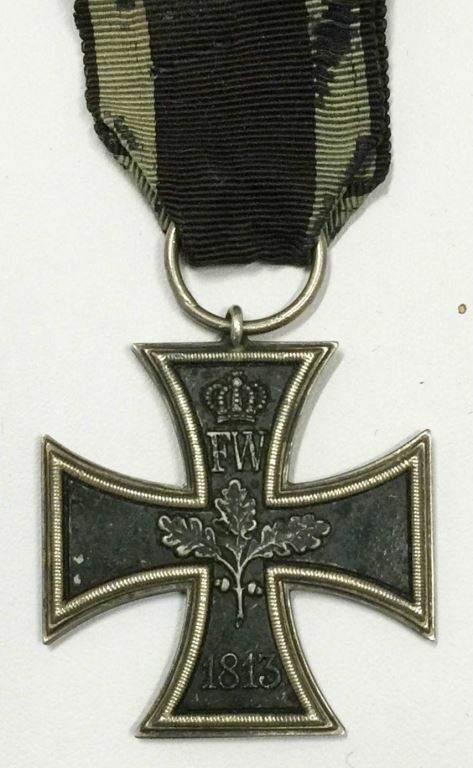 A single Iron Cross could therefore be awarded to several combatants. This continued until the 1830’s when it was decided clear the backlog and to award an Iron Cross to those still waiting to ‘inherit’ one. This required a new batch of Iron Crosses to be produced. Those manufactured differed from the earlier versions like this example in being slightly larger and in having flat centre plates without a peripheral step, in general resembling subsequent issues of the cross. Note: The 1813 Iron Cross is in the British section as they were allies at the time of the Peninsular Wars. Single: Maharajpoor Star 1843 James Devine HM 39th Regt. With service docs, transferred to the Royal Canadian Rifles after 20 years service with the 39th. 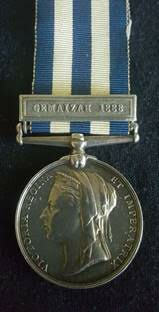 Single : SOUTH AFRICA MEDAL1853 impressed : LIEUT. H.J.N. KING 6th REGT wounded in action 9.6.1851. A superb medal to an easy to research Officer thanks to his triple initial. 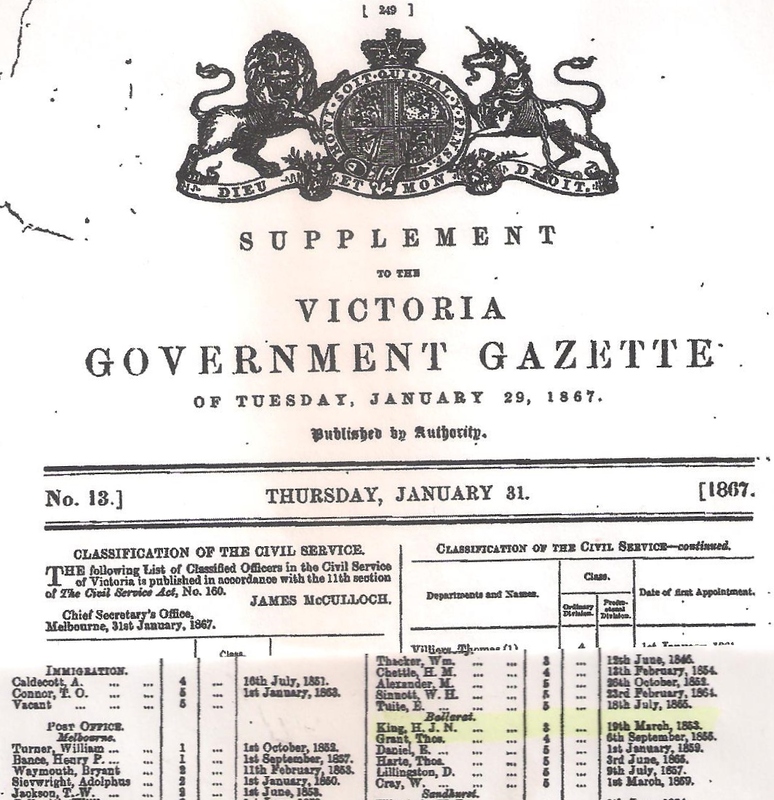 The State of Victoria Gazette of Jan 29 1869 under "POST OFFICE" then "BALLARAT" shows him taken on strength of the Victorian Government in 1853 - the year before EUREKA. Numerous newspaper reports show the demise of King for embezzlement of the Ballarat Post Office in 1869. There is much more research that can be done on this Officer and it would be interesting to learn if he played any part in the EUREKA uprising due to the probable central meeting place of the Ballarat Post Office and his loyalty to the Army. Note: There appears to be three soldiers of the 91st with this name and initial and a curious note in records that states a "Miller" (of the 91st) has a medal for Gallant Conduct (not engraved). Note: Alfred James Sharp was born in Millbrook, Southampton. He joined the Royal Artillery on 6 July 1882, aged 19 years. He initially served in the 1st Brigade Scottish Division R.A., which later became Mountain Artillery. Served in India, September 1883-February 1890 and took part in the Black Mountain Expedition 1888. Sharp was transferred to the Army Reserve in February 1890 and discharged on 5 July 1894. His intended place of residence being given as King Street, Brynmawr. He later joined the Royal Monmouthshire Engineers Militia and served with them in the Second Boer War. With copied R.A. service papers and roll extracts on paper and C.D. Single: India General Service 1895-1902, 2 clasps, “Punjab Frontier 1897-98, Tirah 1897-98” 97147 Bombr W. Hackworthy No 1 Mtn Bg RA. INDIA GENERAL SERVICE MEDAL1854 one clasp : "Burma 1885 - 7" named in running script to: 1162 Pte. T. Keohane 2nd Bn.Rl.Muns.Fus. This medal was originally found on the Geraldton rubbish tip - north of Perth. It appears the Keohane family came to Western Australia in the early 1900's. Single: India General Service 1854-95, 1 clasp, North West Frontier impressed to 578 DRIVR. W. J. SMITH, D By. F Bde. R.A. Single: INDIA GENERAL SERVICE MEDAL1854 One Clasp; "Burma 1885-7". 2373 Pte. J. Wilson. 1st Bn. Pl. Welsh. Fus. Single: INDIA GENERAL SERVICE MEDAL 1854 One clasp: "Burma 1885-7" 1622 Pte D.McEwen. 2nd Bn. R.Scot. Fus. Single: INDIA GENERAL SERVICE MEDAL1854 One Clasp; "Burma 1887-9". 1105 Cpl. F. Lee. 1st Bn. Ches. Rgt. Single: INDIA GENERAL SERVICE MEDAL 1854-95, one clasp "Jowaki 1877-8" impressed naming to 1521 GUNNER C. VERNEY. 13/9th R.A. Note: Ex Trevor Bushell Taylor Collection. Single: INDIA GENERAL SERVICE MEDAL 1854 One Clasp: "Burma 1887- 89". 2812 Corpl.P. Reilly. 2nd.Chesh.Rgt. 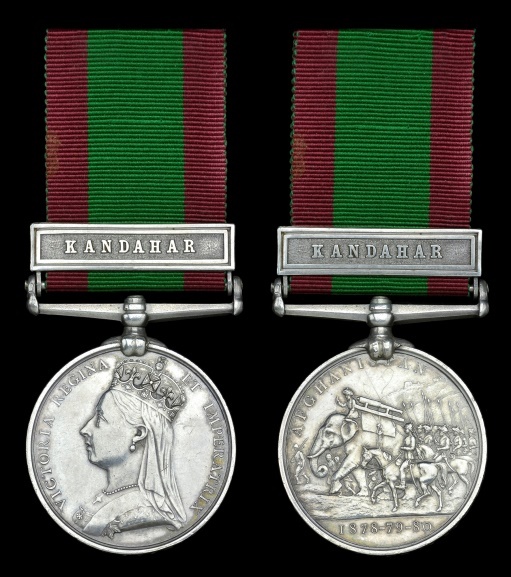 Single: INDIA GENERAL SERVICE MEDAL1854 One Clasp; "Burma 1889-92". 342 Serjt. T. Wilkins 2nd Bn Devon RGT. Single: India General Service 1854-95, 1 clasp, “WAZIRISTAN 1894-5” to 2804 Pte. T. Glendinning, 2nd Bn. Border Regt. Single: INDIA GENERAL SERVICE MEDAL 1854 One clasp:. "Burma 1889-92". 1583 Pte.R.Kilgannon. Devon.Rgt. Later impressed naming. Single: INDIA GENERAL SERVICE MEDAL1854 One Clasp; "Hazara 1891" 1722 Pte. E. Williams. 1st Bn R. Welsh Fus. James Canning was born in October 1827 and enlisted into the 2nd Dragoons at Edinburgh on 13 April 1846, for an unlimited period of engagement. He embarked with the regiment during April-June 1854 for service in the Crimea. The muster rolls confirm that Canning was on active duty with his regiment for the whole of the quarter of the 1st October to the 31st December 1854, and it is most probable, therefore, that he took part in the famous charge of the Heavy Brigade at Balaklava, in which the Scots Greys had two men killed and fifty-six wounded. Seven men were awarded the Distinguished Conduct Medal. Canning returned from the Crimea during the latter part of 1855, subsequently purchasing his discharge from the army in September 1856. 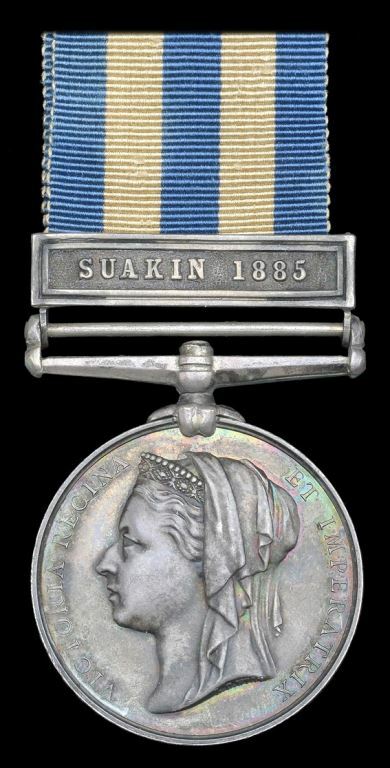 It should be noted that the 2nd Dragoons were not present at Inkermann and that Canning’s medal should technically have clasps for Balaklava and Sebastopol only. The mistake is easily explained by examining the regimental medal roll compiled ‘Camp Crimea. 11 January 1855’ (WO 100/24) which clearly shows the letter ‘I’ in the column for ‘Inkermann Novr. 5’ against many names, including Canning, in addition to the letter ‘B’ to indicate entitlement to the clasp for Balaklava. Consequently many men of the 2nd Dragoons were officially issued with the Inkermann clasp. A separate roll was compiled in November 1855 listing those entitled to clasps for Sebastopol, most of which were despatched as loose clasps at a later date. 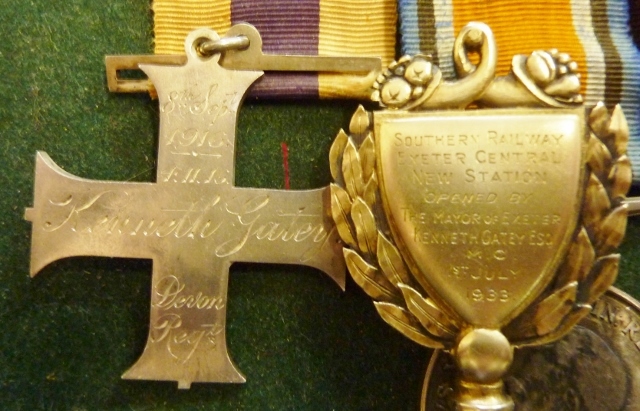 Sold with copies of relevant medal and muster rolls. Pair: Private J. Hughes, 63rd Regiment Crimea 1854-56, 4 clasps, Alma, Balaklava, Inkermann, Sebastopol (63rd Regt.) officially impressed naming; Turkish Crimea 1855, Sardinian issue, unnamed, pierced with ring suspension. James Hughes was born in Lancaster. A Shoemaker by occupation, he enlisted on 1 July 1852. Died at Scutari on 31 January 1855. With some copied roll extracts. Pair: Private W. Halls, 1st Battalion Rifle Brigade. Crimea 1854-56, 4 clasps, Alma, Balaklava, Inkermann, Sebastopol (1st Bn. Rifle Bde.) officially impressed naming; Turkish Crimea 1855, contemporary engraved naming "W. HALLS 1ST BN RIFLE BDE"
William Halls was born in Bildestone, Suffolk. A Labourer by occupation, he enlisted into the Rifle Brigade at Ipswich on 15 December 1845, aged 17 years. On 4 November 1851 whilst serving at Dover, he was sentenced to 55 days imprisonment for a civil offence, being released on 27 December 1851. During January 1852- January 1854 he served in South Africa, participating in the Second Kaffier War for which he was awarded a medal. In July 1854 he embarked with his battalion for the Crimea and took part in the actions at Alma, Balaklava, Inkermann and Sebastopol. On 27 December 1854 he was admitted to Scutari Hospital. He died there on 8 February 1855. Single: Crimea 1854-56, 4 clasps, "Alma, Balaklava, Inkermann and Sebastopol" officially impressed to Jas. Binns, Rifle Bde. 3415 Private James Binns joined the Rifle Brigade at Portsmouth on 20 February 1854, aged 17 years. Soon on active service, he went with the regiment to the Crimea, landing at Eupatoria on 14 September 1854. He was in action at Alma, 20 September 1854; served in trenches before Sebastopol; saw action at Balaklava, 25 October 1854; fought at Inkermann, 5 November 1854 - his rifle being hit and broken by grape shot; took part in a night attack on 20 November 1854 - and received a minor wound to his lip by a spent ball; then took part in the taking of the Quarries and the storming of the Redan. Further service followed in India and the suppression of the Indian Mutiny and then in the Cape Province. His military service is recorded in ‘Short Account of the Experiences of James Binns (late of the Rifle Brigade)'. With photocopies of the six pages of this short account. This is an extremely interesting soldier's account of many key events he was involved in. Amongst them include being present at the storming of the "Rifle Pits" before Sebastopol when Lt. Cunninghame and Bounchier won their VC's and even when General Catheart fell from his horse shot dead. Please feel free to request a copy of account as it is well worth the read. Single : CRIMEA MEDAL1854 no clasp officially impressed Edwd.Cox 7th Regt. 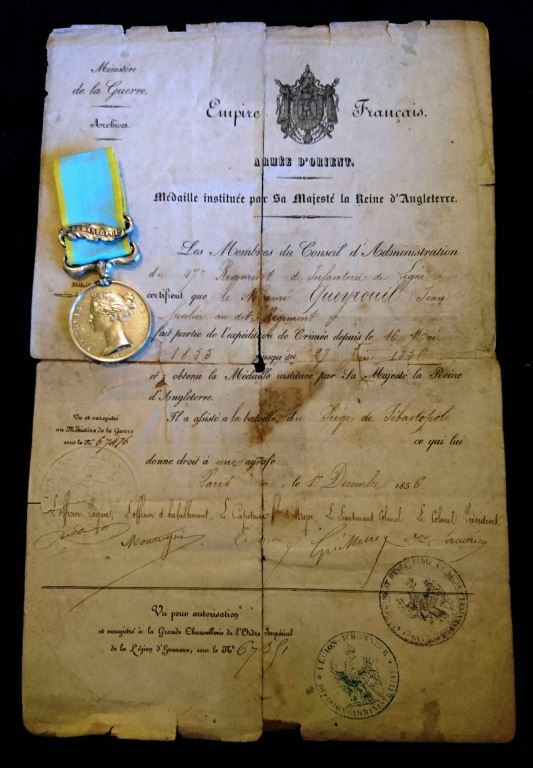 Note: With French Imperial award document for the British Crimea Medal with clasp Sebastopol, awarded to Fusilier Jean Gueyrouil (? ), 47th Regiment dated 1 December 1856. Document creased and repaired. single: Turkish Crimea 1855, French issue, unnamed, fitted with a bar suspension. Single: Indian Mutiny Medal 1857-58 two clasps "LUCKNOW & DELHI" impressed to CORPL JOHN MARTIN 1ST EURN BENGAL FUSRS. Note: Confirmed on roll & note stating that transferred to 4th Bengal Fusiliers. Single:Indian Mutiny Medal 1857-58 one clasp "CENTRAL INDIA" period engraved to 569 PTE W. MCGUIRE 3RD MADRAS EUROPEAN RGT. Single: Indian Mutiny Medal 1857-58 one clasp "CENTRAL INDIA" impressed naming to COLR SERJT J. F. STEVENS. 86TH REGT. Single : INDIAN MUTINY MEDAL 1857 one clasp "Delhi" Impressed B.Cogan 52nd L.I.. The 52nd were in the thick of the fighting at Delhi. Single: Indian Mutiny Medal 1857-58 one clasp "CENTRAL INDIA" impressed to GEO. WESTALL 8TH HUSSARS. Single : CHINA WAR MEDAL 1857-60 two clasps "Canton 1857, Taku Forts 1858". Unnamed as issued. The 12th Regiment arrived at Sydney in 1854 and served in New Zealand from 1860-66. It was engaged in the first Taranaki War, being present at No. 2 Redoubt and was in action throughout the Waikato War. It sustained losses at Rangiriri and fought at Gate Pa. The Headquarters moved to Napier in December 1865 and then moved to Tauranga in 1866, where part of the regiment took part in the Tauranga bush campaign. ‘Yesterday evening a presentation of a purse of twenty sovereigns by the members of the First Rifles, S.T.V., to Acting Sergeant-Major Manning of H.M. 12th Regiment, who since the formation of the Corps, has filled the post of Drill Instructor, took place at the Town Hall. “Sergeant Manning - The pleasing duty has devolved upon me, as the Captain Commanding the First Rifles, to convey to you, on the part of the Corps, the expression of their appreciation of your services as Drill Instructor. We feel, that to your unwearied assiduity and never failing patience, the present state of efficiency, which without boasting I may say is second to no corps in the Colony, is in great measure owing to you. I have now the pleasure of presenting to you this purse as a token of the good feeling entertained by the Corps towards you, and the high place you hold in their esteem. l am quite sure that wherever duty may call you, you will not forget the First Rifles, and you will ever carry with you the best wishes of the members of the Corps. Single: NEW ZEALAND WAR MEDAL (undated reverse) correctly impressed 425. JAS. MANGAN. 57TH FOOT. Single: Afghanistan 1878-80, 1 clasp, Kandahar (B/375. Pte. W. Davis. 66th Foot.) Correctly chisel engraved regimental number leaving no doubt as to the recipient. B/375 Private William Davis was killed in action at Maiwand on 27 July 1880 (WO 100/52 refers). Note: He is not entitled to the clasp for Kandahar which appears to have been fitted in error, the roll showing the entry above for John Davis being present at Kandahar. Private William Davis is confirmed on the 66th Foot memorial at Reading as being killed in action at Maiwand. 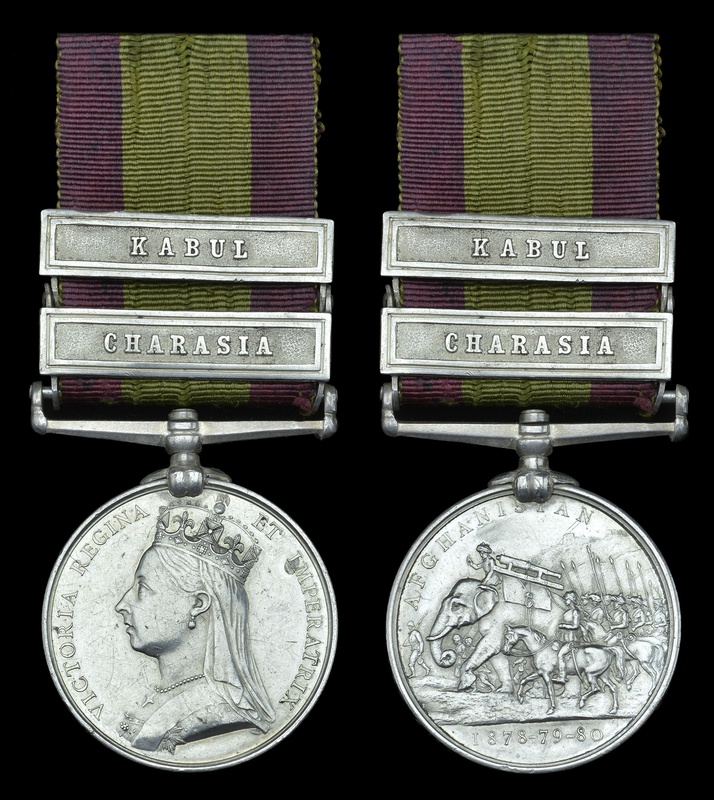 Single : AFGHANISTAN MEDAL1878 two clasps "Charasia, Kabul" engraved 4560 Dvr.J.Minahan, L/5 R.A. 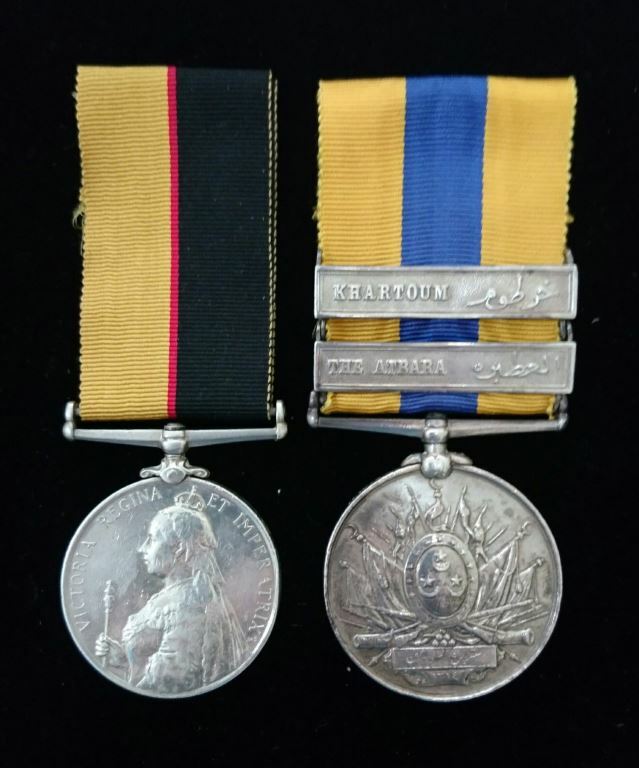 Single: Afghanistan medal 1878-80 one clasp "PEIWAR KOTAL" correctly named to 990 PTE J. WILTON 2/8TH REGT. Note: Roll states " DEAD 26/7/81" 2nd Bn Liverpool Regiment. Sold with a copied medal roll for the 67th Foot. 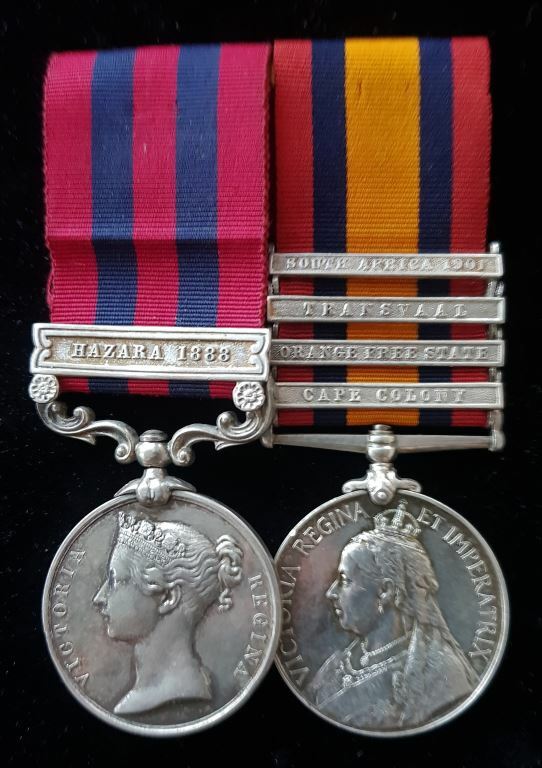 Single: Cape of Good Hope General Service Medal 1880-97 one clasp "TRANSKEI" correct period engraving to TPR J. H. SMITH BAKERS HSE. Note: With copied roll extracts confirming clasps. Note: 60634 Petty Officer First Class Joseph Terry, born Brixham, Devon, September 1854; joined the Royal Navy as Boy second Class, January 1871; advanced Ordinary Seaman, December 1877; transferred to H.M.S. Tourmaline, September 1880; H.M.S Duke of Wellington , September 1882; H.M.S. Excellent, February 1883; H.M.S. Condon, December 1883; promoted Petty Officer Second Class, July 1887; transferred to H.M.S. Excellent , September 1887; promoted Petty Officer First Class, June 1888; shore pensioned, January 1893. Single: EGYPT MEDAL 1882-89, (undated reverse) one clasp "Gemaizah 1888" correct period engraved naming to 3054. Pte W. Handcock. 2/K.O. Sco: Bord. 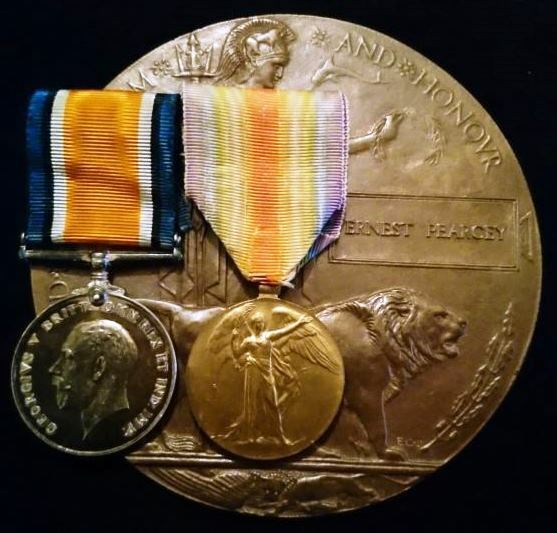 Single : EGYPT MEDAL undated one clasp "Gemaizah 1888" 1072 Pte.J.Soper 1/ Welch R.
Born in Ramplsham, near Maiden Newton,Dorsetshire and attested Welsh Rgt. 28 Feb 1885 aged 24 1/2 years. Served Egypt & Sudan Dec 1886 to aug 1889. Discharged 'time expired" 27 Feb 1897. Pair: Egypt and Sudan 1882-89, undated reverse, 1 clasp, Gemaizah 1888 correctly named to 2323 Pte B. Hirst 2/K.O.S.B. ; Khedive’s Star, undated, unnamed. Single: Egypt and Sudan 1882-89, undated reverse, 1 clasp, Suakin 1885 correctly named to 5320 Pte. W. L. Galliers, M.S. Corps. Single : INDIA GENERAL SERVICE 1895 - 1902, 1 clasp, Punjab Frontier 1897-98 period running script to 3734 Pte A. Cameron, 2d Bn. Arg. & Suth'd. Highrs. With copied roll extract on which he is listed as "Deceased"
Pair; QUEENS SUDAN 1896-98 & KEDIVES SUDAN 1896-1908 one clasp "HAFIR" both engraved 3415 Pte.C.Ford. 1.N.STAFF.Rgt. John Martin was born in Dublin. A Labourer by occupation, he attested for the 49th Regiment at Fermoy, 11 January 1853, aged 14 years, 7 months. With the regiment he served as a Drummer until transferring to the 82nd Regiment as a Private in February 1869. With the regiment he was promoted to a Corporal in November 1870; Sergeant in August 1874 and Colour Sergeant in December 1874. During his military career he served 3 years, 9 months in India. He was discharged at Dublin on 9 December 1879. Awarded the Army L.S. & G.C. with a gratuity of £5 in August 1875; awarded the Meritorious Service Medal with an annuity of £10 on 27 November 1915. Latterly the Chief Warder at the Military Prison, Cork. With copied service papers and other research. Queen’s South Africa 1899-1902, 5 clasps, Tugela Heights, Orange Free State, Relief of Ladysmith, Transvaal, Laing’s Nek (3503 Serjt., S. Lanc.Regt. ); King’s South Africa 1901-02, 2 clasps (3503 Clr.-Serjt., S. Lanc. Regt. );Army L.S. & G.C., E.VII.R. (1st Cl. Sergt-Instr., 1st Bn. G.I.P. Ry.Vol. Rif. Cps.) 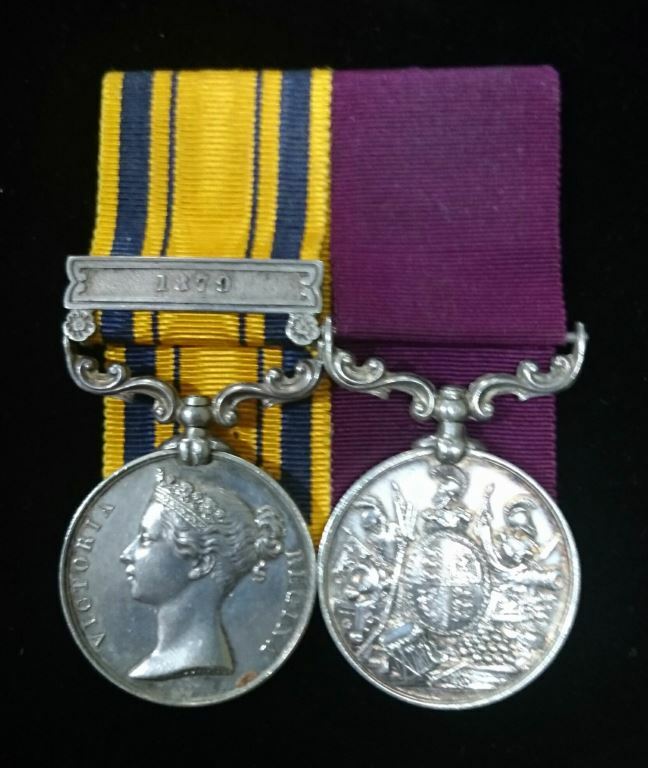 correction to unit; Commonwealth of Australia Meritorious Service Medal, G.V.R. (Staff Sergt-Major, Instl. Staff) John Martin was born in Bullevant, Co. Cork. He attested for the South Lancashire Regiment at Chester on 21 August 1891, aged 15 years, 8 months, and joined the regiment in Jersey two days later. He served as a Drummer until February 1892 when he reverted to Private and was promoted to Lance-Corporal in February 1894; Corporal in August 1895; Lance-Sergeant in March 1898; Sergeant in March 1899 and Colour-Sergeant in April 1902. Served in South Africa, November 1899-January 1903 and in India, January 1903-August 1913. In April 1906 he was transferred to the Bombay Unattached List as a 1st Class Sergeant-Instructor, posted to the Poona Volunteer Rifles and in March 1907, with the same rank, to the Great Indian Peninsula Railway Volunteers. Awarded the L.S. & G.C. in April 1910. Discharged on 21 August 1913 - listing Victoria Barracks, Melbourne, Australia as his intended place of residence. Awarded the Commonwealth of Australia M.S.M. as Staff Sergeant-Major of the 4th Military District (Commonwealth of Australia Gazette 7 June 1917). With copied service and other papers. QSA one clasp "CC" impressed 32631 GNR: T. W. WORTHINGTON 15TH W. D., R.G.A. CHINA 1900 no clasp normal running script to 32631 G. T. W. WORTHINGTON No.91 Co., RGA. Gnr Worthington was born in Bilby, South Retford, Notinghamshire and a former member of the 4th Bn.Derbyshire Rgt.. Served in S.Africa Nov 1899 to July 1900 and China July 1900 to Aug 1901 and India Aug 1901 to March 1907. Reserve 1907 and discharged 1911. Single: CHINA 1900 no clasp. Impressed to F. Pritchard, Ord., H.M.S. Pique. Single: Volunteer Force Long Service, V.R. correct period naming to 343 SERGT H. TAYLOR 1ST V.B. LEICESTERSHIRE REGT. 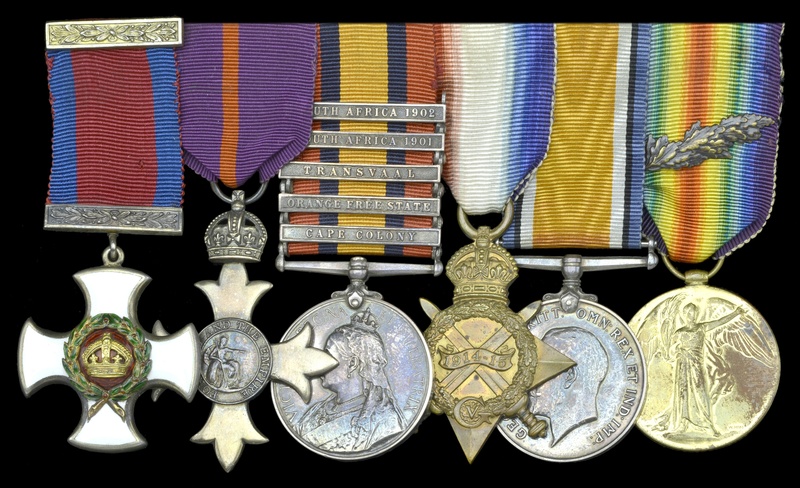 Four: 1914/15 star, British War, Victory Medal and L. S. G. C. Medal (GV) all correctly impressed to 7193 C. SJT. D. TAYLOR SCO. RIF. Single: Africa General Service 1902-56 (EVII), 1 clasp, “Somaliland 1902-04” correctly named to A. W. HENDERSON A. B. HMS HYACINTH. Note: Hugh Reginald Oriel Walker first commission (ex Sandhurst) 9th Jan 1904. To Indian Army: 8th March 1905 (25th Punjabis), LT. 9th April 1906: Captain 9th Jan 1913: Major 9th Jan 1919: Lt Colonel 9th Jan 1930: Retired 26th July 1933. Single: Khedive’s Sudan 1910-21, 2nd issue, no clasp, unnamed. 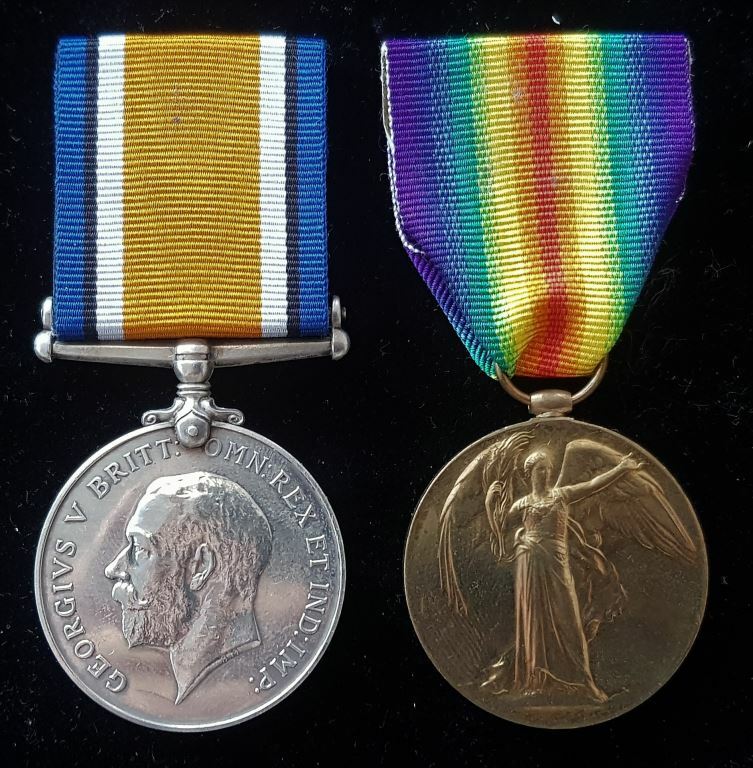 Trio: 1914/15 Star, British War and Victory medal correctly impressed to 7310 PTE M. WATTERS R. SC: FUS: Watters is incorrectly spelt with one "T" on BWM & VM which is how it is spelt on the British War and Victory Medal roll of the Royal Scots Fusiliers (copy included). Note: Misspelt Pearcy on medals compared to Pearcey on Memorial Plaque. Note: George Denyer was born in Chatham, Kent on 22 October 1889. A Boiler Maker by occupation, he entered the Royal Navy in September 1911. During the Great War he served on King George V, April-November 1914; Leander, November 1914-March 1915; Victory, April 1915-June 1917; and Wallington, variously during 1917-18. Awarded the Royal Navy L.S. & G.C. when serving on the fleet repair ship Sandhurst. With copied service paper. Note: Thomas Powell was born in Leeds, York on the 2nd April 1885. During the Great War he served on the H.M.S. Victory, May-June 1915; H.M.S Excellent, June-Aug 1915; and H.M.S. Canada, from August 1915 during the battle of Jutland and until being demobbed in April of 1919. With copied service paper. H.M.S Canada joined 4th Battle Squadron Grand Fleet in October 1915. Present at the Battle of Jutland 1916 Firing 42, 14inch rounds and managing to receive no damage during the battle. 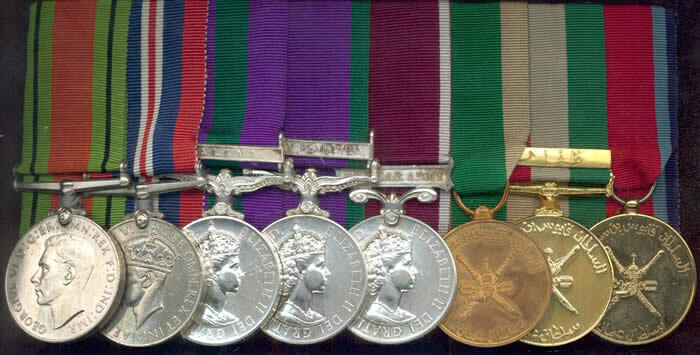 Three: British War medal, Victory medal and Territorial War Medal. 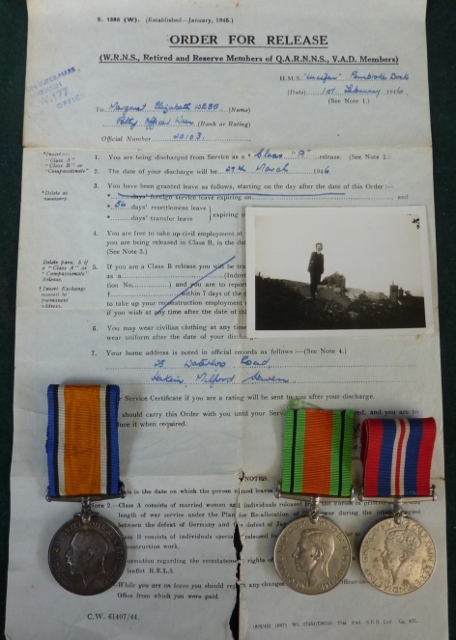 Medals impressed to 2328 PTE F. WENHAM R.A.M.C. Royal Army Medical Corps (Territorials) attested Maidstone 10th August 1914; served India 29th October 1914 to 17th May 1918; South Africa 18 May 1918 to 29 January 1919; demobilized 17 April 1919. Note: Medal card shows Frank Wenham as serving as number 493235 as well. Pair: British war and Victory medal impressed to 42820 PTE A. W. G. MOUNT. M.G.C. 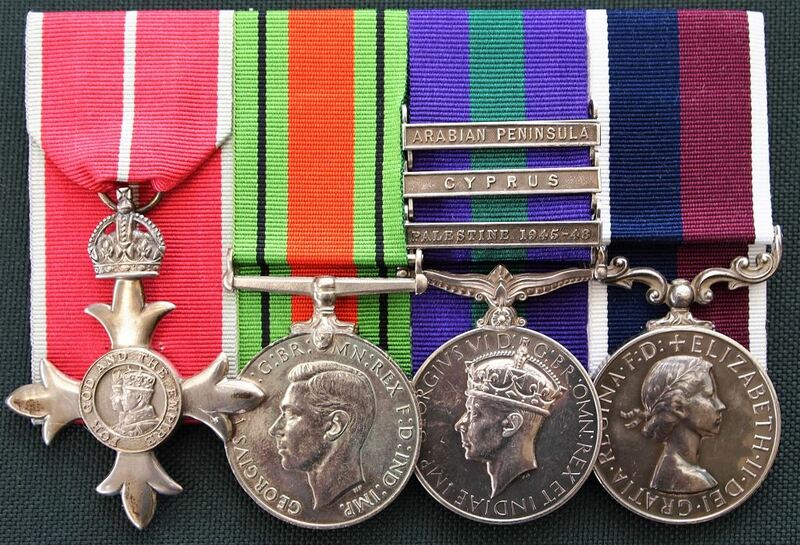 Five: Defence Medal, War Medal, GSM Malaya & Cyprus, Korea pair 22773764 Pte GR Evans Welch (Cpl on GSM). 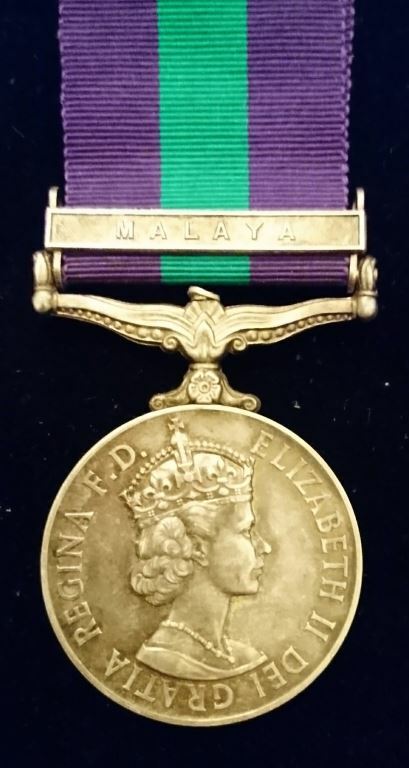 Eight: Defence Medal, War Medal, General Service Medal E2 clasp Malaya 22847192 Sgt D G Bennett RAOC, Campaign Service Medal E2 clasp Malay Peninsula 22847192 WO CL 2 D G Bennett RAOC, Long Service & Good Conduct Medal E2 Regular Army 22847192 WO CL 2 D G Bennett RAOC, Sultan of Oman Peace Medal and General Service Medal clasp Dhofar unnamed as issued, Sultan of Oman As-Samood Medal unnamed as issued. The group is mounted court style as originally worn and comes with an original German ID pass, presumably used when serving with BAOR. Note: The Sultan of Oman Medals were manufactured by Spink of London. The medals were instituted by Sultan Qaboos bin Said in 1976 at the end of the Dhofar Rebellion which had begun in 1962 for service in Dhofar. As-Samood Medal (Midal al-Samood). Single: GSM QE2 with bars Malaya, Arabian Peninsula, Brunei. Correctly named to 23734265 Spr D. O'Rahilly RE. GSM Clasp Canal Zone 22541899 SIGM WAJ Griffin R Signals, AGS Clasp Kenya I.P. W Griffins, AGS Clasp Kenya 22541899 CPL WAJ Griffin R Sigs and the Sultan of Oman As-Samood Medal unnamed as issued..
General Service Medal E2 clasp Arabian Peninsula, Campaign Service Medal E2 clasp Northern Ireland, Long Service & Good Conduct Medal E2 Regular Army to Staff Sergeant A M Shearer, Royal Army Ordnance Corps. Long Service & Good Conduct Medal E2 Regular Army 23534022 S Sgt A M Shearer RAOC. Note: With many entries from the RAOC Gazette, provided, enlistment to retirement as a WO2. GSM 62 clasp DHOFAR, UN Cyprus, RAF LSGC ER11 to G1960022 Cpl A Harrison RAF. LSGC names as SGT. CSM clasp Dhofar 24181255 Gnr A Drummond RA. GSM clasp Malaya 23281842 PTE E A A G STANDEN QUEENS. Single: GSM One Clasp; "PALESTINE 1945-48" 14353405 PTE. P. BROWN EAST YORKS. Single: GSM (GV1) One Clasp; "PALESTINE 1945-48" 14468457 SJT. J. BROWN R. A. 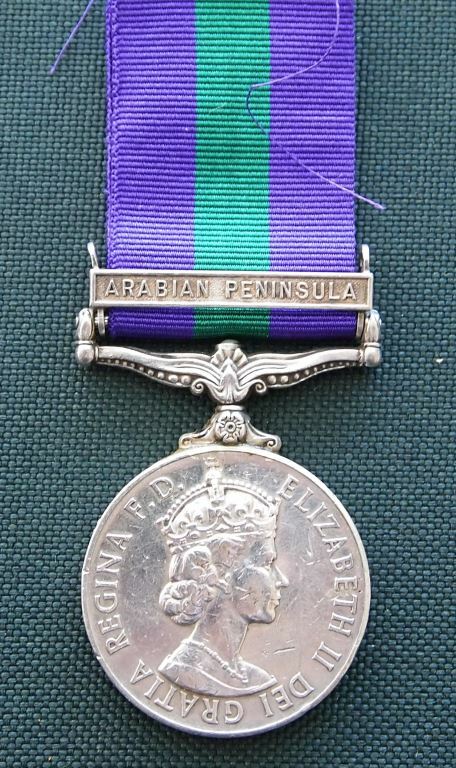 Single: GSM (GV1) One Clasp; "PALESTINE 1945-48" A/CPL F. E. HAMILTON (1349898) RAF. 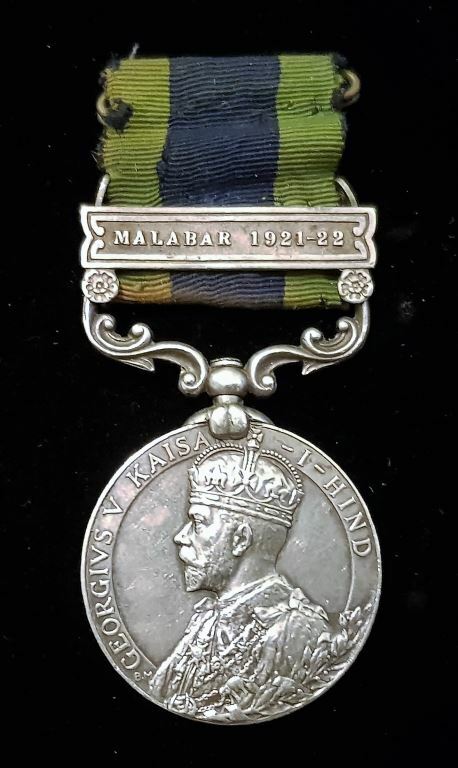 Single: General Service Medal 1918-62 (EIIR), 1 clasp “Malaya” impressed to 22409281 CPL L. MELSOME R. A. M. C.
Single: GSM (QE11) One Clasp; "MALAYA" 22979869 TPR. T. HOGAN. 11 H.
Single: GSM (QE11) One Clasp; "CYPRUS" 2303751 PTE. J. SOUDEN. GORDONS. Note: Autumn1955, 1st Battalion of the Gordon Highlanders was on leave in the United Kingdom. They were recalled with 48 hours’ notice and were the first British Army Unit since 1945 to fly out to an Emergency. The Gordon’s two main aims were to improve security and to obtain information. Single: CSM (QE11) One Clasp; "NORTHERN IRELAND" 23994474 BDR. J. A. WARNER R. A. Single : ASHANTI MEDAL 1900 no clasp impressed Headman D.Edison A.F.F. 1. 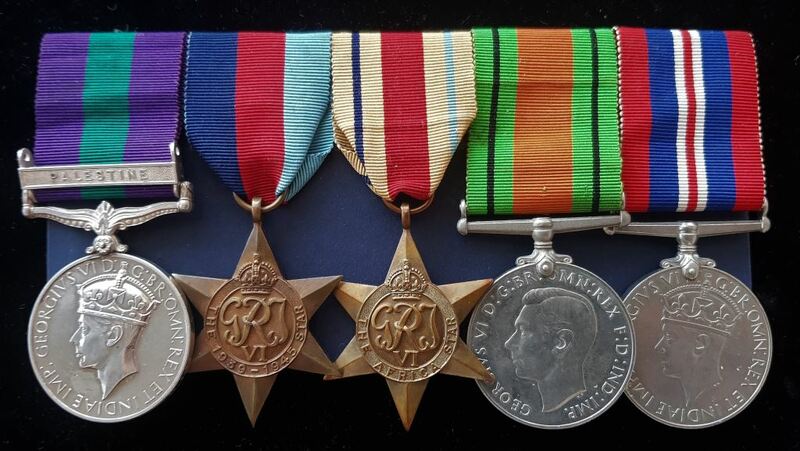 GROUP OF SIX: 1939/45 Star, Atlantic Star, France and Germany clasp, Africa Star, Defence Medal and War Medal all unnamed as issued and still in outer sleeves. Attributed to Royal Navy Signalman D/JX 208027 Arthur Kenneth Wallace Boley and comes with a large amount of original paperwork, photo's (with signatures of the full course on reverse of group photo), Drivers License, Naval signals hand written notes (not in photo as too large) and other Ephemera related to Signalman Boley. Leading Signalman Boley (also appears as Bowley) was taken prisoner of war in the commando (Tobruk) action when his ship "HMS SIKH" was lost in a gallant action along with "HMS ZULU" in 1942. Friday 2nd October 1942 the Western Daily Express published the following "Signalman Kenneth Boley.... is reported missing following the loss of HMS SIKH at the attack on Tobruk"
The fact that Sig. Boley was taken P.O.W. is confirmed by his original discharge (included with medals) which shows he has been granted Prisoner of War Leave (discharging from the HMS Rodney in 1946). An estimated 70 survivors of the HMS SIKH were picked up in the water or were able to make it to shore. In March 1943 an unprecedented event occurred with the exchange of 788 POW's in the neutral Turkey. This exchange has caused many a debate as it was outside the Geneva Convention (and not handled by the Red Cross) and thus the POW's were technically allowed to re-join the war effort and most went on to take part in D-Day. Due to the large amount of original paperwork with this group, we can see that Sig. Boley was back in service in 1943 and must have been part of this amazing exchange. 2. 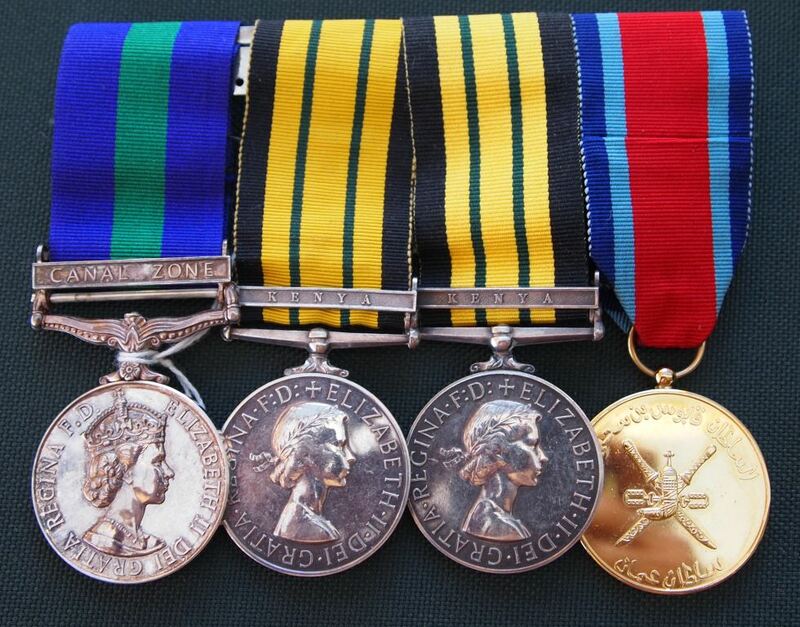 Pair: Defence Medal and War Medal unnamed as issued. Attributed to 20103 Petty Officer Margaret Elizabeth Webb W. R. N. S. (Wife of Signalman Boley) comes with original discharge (order of release) certificate dated 1946 and photo in uniform. 3. 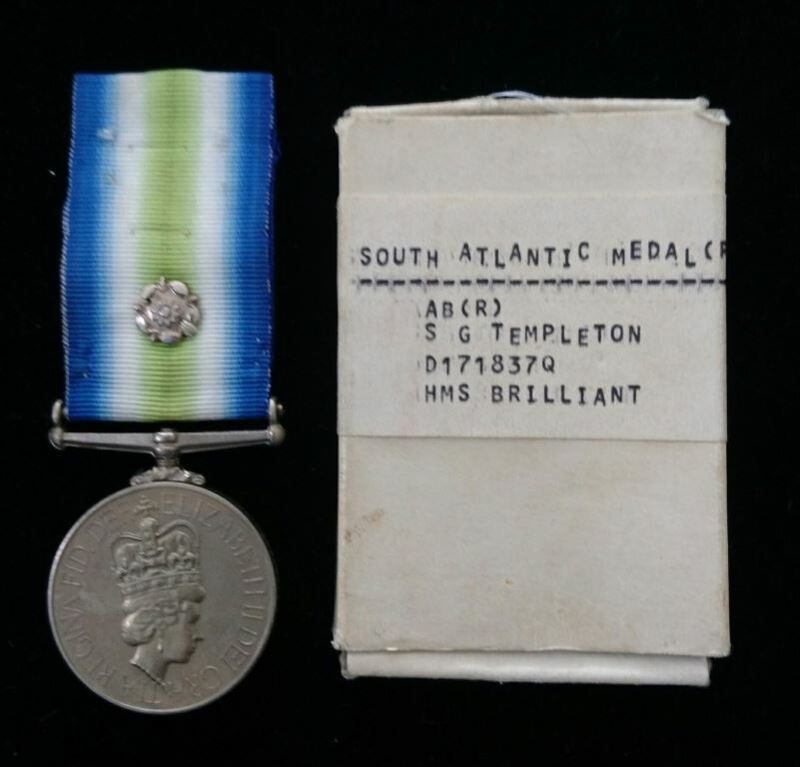 Single: British War Medal correctly impressed 1015652 PTE. E. R. WEBB C. M. G. BDE. Edward Robert Webb enlisted in 1916 with the 231st Battalion of the Canadian Expeditionary Force (Father of Margaret Webb). 4. 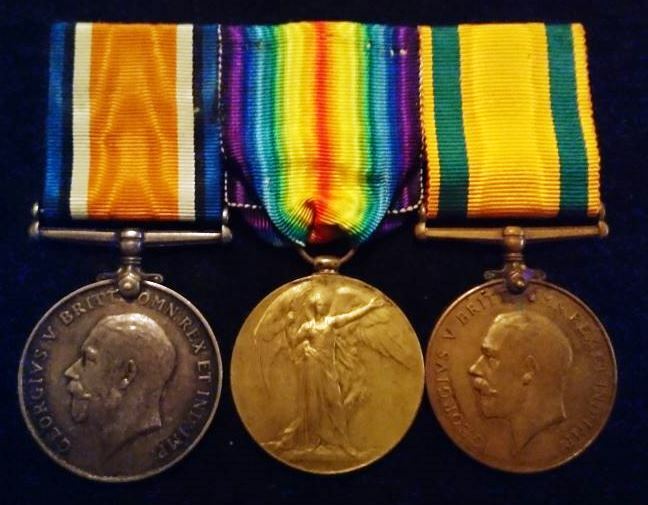 TRIO: 1914/15 Star, British War Medal and Victory Medal impressed to SE 4755 PTE E. H. BOLEY A.V.C. Ernest Boley served in the Army Veterinary Corps embarking on the 6th Match 1915 for France (Father of Signalman Boley). 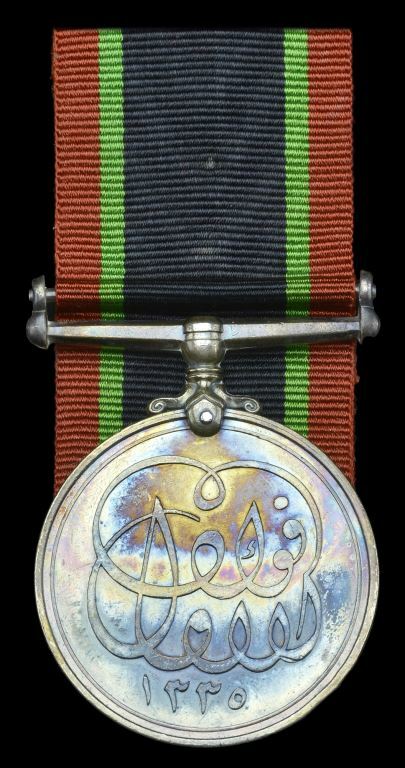 Single : AFGHANISTAN MEDAL 1878 no clasp . 1736 Pte G. Gibbons, 4th Bn. Rifle Bde. Sold with copied attestation and discharge papers. Pair: Private J. McLean, Cameron Highlanders Egypt and Sudan 1882-89, dated reverse, 2 clasps, Tel-el-Kebir, The Nile 1884-85 (138 Pte., 1/Cam’n. Highrs. ); Khedive’s Star, 1882, unnamed as issued. Single : EGYPT MEDAL dated 1882 no clasp. R.Hardy A.B. HMS THALIA. Single : NATAL 1906 one clasp "1906" impressed S.S,M., A.J.Pannewitz. Natal Carbinners. Single : NATAL 1906 one clasp "1906" impressed Tpr.A.J.Small. Border Mtd.Rifles. A total of 251 medals to the unit. Trio: Queens Korea Medal, United Nation Korea medal and Korea 50 year anniversary medal. Queens Korea Medal impressed 22540855 PTE. K. INGHAM. KINGS. UN Korea unnamed as issued. Comes with regimental cap badge. Single: GSM clasp "Malaya" impressed to 2/LT. M. B. EVERITT. FORESTERS. Comes with original box, copy photograph and regimental cap badge. Note: HMS Brilliant was involved in many incidents during the war including the shooting down of three A-4 Skyhawks. In defence the type 22 frigate came under Argentine air attack outside San Carlos Water where she was slightly damaged by cannon fire. Comes with original box of issue. Single : NATAL 1906 no clasp impressed Tpr.J.Binnie. Lower Tugela Res. A total of 35 medals to the unit. Single : NATAL 1906 no clasp impressed Dvr.G.W.Ralph. A.Battery.N.F.A. Single : NATAL 1906 no clasp impressed Tpr.H.M.Posner. Natal Police. 32 no clasp medals to the unit. Single : NATAL 1906 no clasp impressed QMS. J.W.Dale. New Hanover Res. Group of Four: 1939/1945 Star, France & Germany Star, 1939-1945, Defence and War Medal to 3776911 Sgt Herbert Horatio Austin. Unnamed as issued. After a brief stint in the air force in 1933, Sgt Austin enlisted on the 16th June 1940 with the King's Regiment. Sgt Austin's Special Service Brigade booklet for the Commando's shows he was taken on strength of the 2nd Special Boat Squadron on the 17th August 1943 and it was not until 1946 that Sgt Austin transferred to the reserves. Complete with Certificate of Service & Discharge Royal Air Force, National Registration Card, Embarkation Card, Ration Book, Application for Particulars of Soldiers Pay, Old Comrades Association of the Special Service Brigade Card & Letter, Record of Service Card, Certificate of Transfer to the Army Reserve, Soldiers Release Book Class "A" and Photograph. Seven: 1939/45 Star, Africa Star, Italy Star, Defence Medal, War Medal, General Service Medal (GVI) “Malaya” and African General Service Medal (QEII) “Kenya”. First five unnamed as issued. GSM and AGSM correctly impressed to 5618908 PTE A. E. JEFFREY DEVON (5618908 SGT A. E. JEFFERY DEVON on African General Service Medal). Having spent the duration of his time under siege in Malta the unit embarked for Alexandria in March 1943 and after a short stint of training, they were ready for the invasion of Sicily (during the Sicilian campaign the Malta Brigade took 40 percent casualties). After the Sicilian campaign the regiment was further tasked with the Invasion of Italy of where Private Jeffery was knocked out during the advance. After recovering from his injuries Private Jeffery found himself attached to the American forces advancing on Rome whilst his unit had been withdrawn in preparation to D-Day. Spending two months with the Americans Private Jeffery was finally withdrawn and sent back to the UK. As his unit was already deployed Private Jeffery found himself floating around the UK attached to several units, even at one stage spending a short stint in a military prison (for trading boots). This accounts for no long service medal. At the end of the war, now Lance Corporal Jeffery’s was posted back with the Devon’s to Singapore, Hong Kong and surrounds in the jungle fighting against the uprising groups of Communist insurgents. In 1949 L/Cpl Jeffery was discharged in the UK and after a year of civilian life, re-enlisted and was on his way to Malaya. After the fighting in Malaya and promoted to Corporal, Jeffery’s was sent to North Africa as the regime of King Farouk in neighbouring Egypt was in trouble and the Devon’s were at the ready. After King Farouk was driven from power Jeffrey now a Sergeant was sent to Kenya against the Mau Mau revolt (March 1953). Serving further with the territorials after Kenya and now at the age of forty one, Sgt. Jeffery discharged on the 11th January 1963. Note: A chapter in Philip Zeigler’s “Soldiers” Fighting Men’s Lives 1901-2001 is dedicated to Sergeant Jeffery’s life (book included). Also comes with hat badge. Single: GSM (GV1) One Clasp; "PALESTINE 1945-48" 4547337 PTE. G. F. WELLS E.YORKS. Single: NGS (QE11) One Clasp; "NEAR EAST" RM.7747 J. R. KING. MNE. 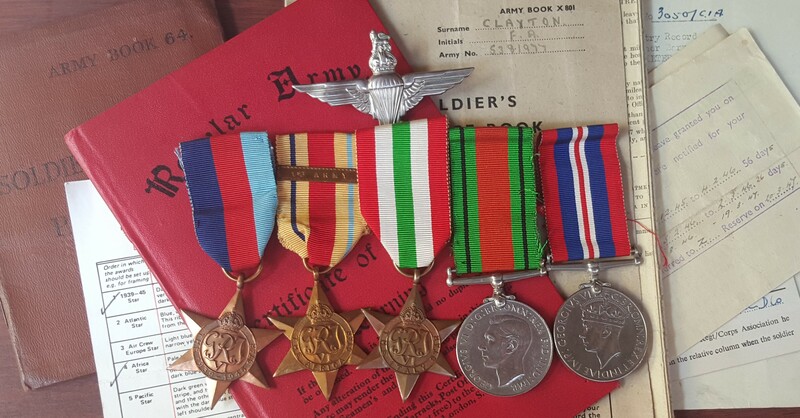 R. M.
Group of Five: 1939/45 Star, Africa Star "1st Army", Italy Star, Defence and War Medal to 5381977 SGT Frederick Arthur Clayton. Unnamed as issued. Sgt Clayton enlisted on the 2nd March 1935 with the Oxford & Buckinghamshire Light Infantry with service in India prior to WW2. During WW2 Sgt Clayton served in the African campaign as a qualified member of the 3rd Parachute Battalion of the Army Air Corps. 1946 saw Sgt Clayton transfer to the Army Reserves with the Royal Engineers. 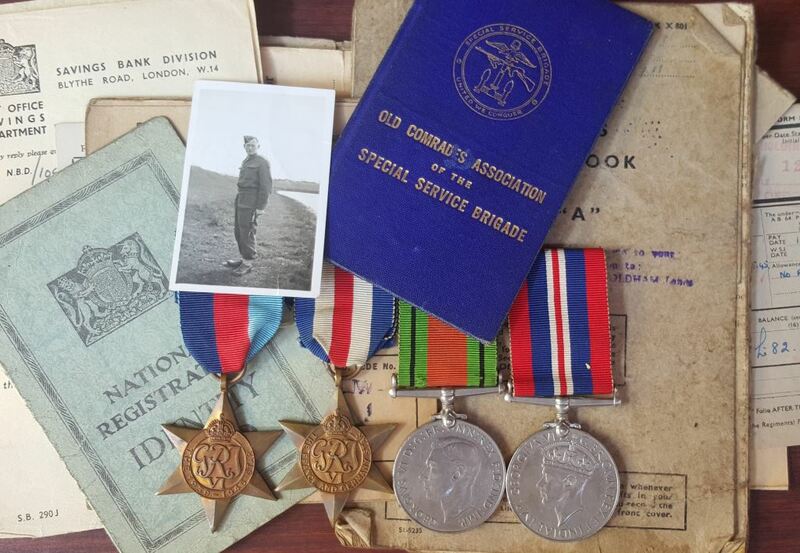 Complete with Army Book 64 Soldier's Service & Pay Book, Record of Service Card, Certificate of Transfer to the Army Reserve, Medals Card, Certificate of Service, Soldiers Release Book Class "A", three Photographs and Para Regiment Badge. Note: Italy star is not shown on his certificate of service even though the medal card supplied shows confirmation of all medals including "1st army clasp". Single: Waterloo 1815 WILLIAM COTTLE, 2nd BATT. 44th REG: FOOT. 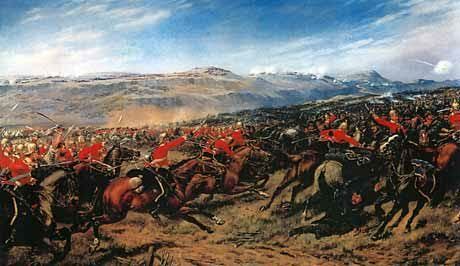 “French Lancers attacked as the Regiment was forming up when it was at a disadvantage having no support on either flank and arranged in lines 2 men deep rather than the squares employed as defence against cavalry. This deployment allowed the lancers to attack from front and rear. The Regiment earned great praise for their stand against the attack from Lord Wellesley-"The troops were long and severely engaged and conducted themselves with utmost gallantry". 14 other ranks were killed and 151 were wounded. Two officers were killed and 17 wounded. Note: Only 38 waterloo medals are recorded to have surfaced for the unit making this one of the scarcest Regiments to obtain. Single: Waterloo 1815 JOHN GILBERT 10th REG. HUSSARS. Note: John Gilbert served in Captain Grey’s number 4 troop and participated in the action on the far left of the battlefield, late in the day. Major Howard, who was the only 10th Hussar officer killed that day, could possibly have been the last Anglo-Allied officer killed , attacking a French square on the last attack. 71 medals are recorded to exist from the unit. Single: Waterloo 1815 RICHARD WILLIAMS 7TH REGIMENT HUSSARS. "We charged twelve or fourteen times, and once cut off a squadron of cuirassiers, every man of whom we killed on the spot except the two officers and one Marshal de Logis, whom I sent to the rear"
Note: 65 medals are recorded to exist from the unit. 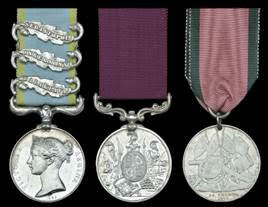 Trio : Distinguished Conduct Medal (VR), India General Service Medal 1895 two clasps: "P.F. 1897-98, TIRAH 1897-98", Queens South Africa Medal 1899 five clasps: "CC, T. HTS, R of L. , BELFAST, OFS". 3640 PTE. A. THOMPSON. 1ST. RL. INNIS. FUSILIERS. All medals correctly named, DCM & QSA impressed, IGS (2nd Bn) in running script. First mentioned in Gen. Buller's despatch 30 March 1900. "Pte. Thompson 3640 on the 23rd February 1900 went to rescue Pte. Nesbitt a heavy wounded man and laboriously brought him to cover under hot fire." A further mention is found in the book "Buller's campaign with the Natal Field Force of 1900" of where the following gives us a better understanding of this heroic action at "Harts Hill"
"They passed along this Bullet-swept path over the Onderbrook Spruit bridge, the Inniskillings leading, and the other regiments following. Every man of the brigade had therefore to run the Gauntlet of the Boer marksman, and numbers dropped on the bridge, where the enemy's bullets were falling thick. Some fifty men were put out of action* in the race over the bridge to the rendezvous further on,..."
"* An act of gallantry was displayed at this spot as the Inniskillings crossed. Private Nesbitt fell badly wounded on the middle of the bridge. With considerable courage Private Thompson of the same regiment ran back and removed his comrade, though under heavy fire, to a place of safety." There has been many a Victoria Cross awarded for similar acts of Gallantry and Private Thompsons actions that day again illustrates to me why the DCM has always been my favourite award for the past 40 years. Single: Crimea medal one clasp "Alma". Officially Impressed to J. YOUNG 55th REGT. On the roll as wounded in Alma and subsequently died at Scutari in 1854. Comes with a letter home of 4 pages of stop start writing, almost like a diary where he describes the arrival of the wounded from the Charge of the Light Brigade to Scutari. Also included is an official disbursement of his assets, An official letter regarding the medal plus an Official envelope addressed to his Sister in Easey Street Collingwood Melbourne Australia. A choice Crimea to a casualty with extremely rare Ephemera and a bonus Australian connection. Single : Military General Service Medal 1793-1814 with four clasps "Toulouse, Pyrenees, Badajoz, Ciudad Rodrigo" impressed naming to A. HILLMAN, DRUMR 40TH FOOT. Enlisted in the 40th. Regiment of Foot on the 5th. March 1808 for limited service aged 16 and served 9 years and 128 days. Discharged in consequence of his term of service having expired on 21st. June 1817. His conduct as a soldier was :- Good, he served in the Peninsular, America and the Continent and was wounded in the left leg at Waterloo on the 18th. June 1815. Description of Discharge :- Alexander Hillman, Drummer, is about 25 years old, is 5 ft. 6 ins. in height, brown hair, grey eyes, fair complexion and by trade or occupation a labourer. His discharge was carried out at Glascow and he was granted 7/6 marching money to carry him to Leith where he was to embark to England, his final destination being Wells in Somersetshire. On arrival at Leith he was granted a free passage to London. Arriving in London he was advanced 22/- marching money to Wells in Somerset being at the rate of 1/10 a day. He was granted a pension of 6d. a day but apparently this was later increased to 8d a day on an application by him dated 9th June 1840. He was admitted as an In-Pensioner to Chelsea Hospital at the end of March 1853 and died there on 28th. June 1870 at the age of 78. N.B. A note written in 1933 by his daughter stated that his Waterloo Medal was lost overboard when he was at sea I.W.T. He served in the American War 1812-14. Another note said that he served 21 years in the army chiefly in India." The medal has an unofficial buckle with "Peninsula" and "Waterloo" and has a slight "wooff" in the carriage between the first and second clasps, but is not damaged in any way. Heavily toned and on what appears to be original ribbon. 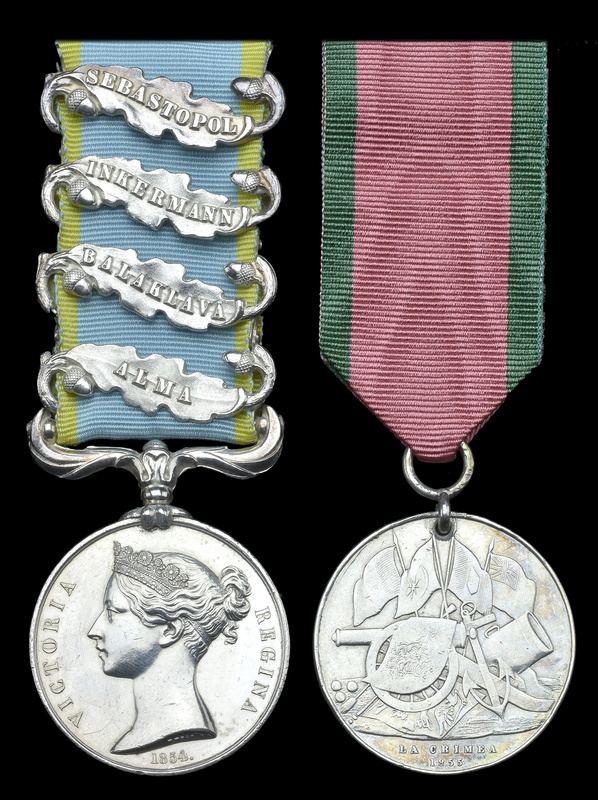 Group of four; Crimea one clasp "Sebastopol" (Lieut) period engraved; Indian Mutiny two clasps "Relief of Lucknow, Lucknow" (Lieut), Ashantee one clasp "Coomassie" (Bt. Lt. Col.); Turkish Crimea Sardinian issue to Lt.Col. J. De Vic Tupper, 23rd Royal Welsh Fusiliers. Contact marks, edgebruising otherwise near very fine and better, together with the 4 related miniature medals, all contained in velvet-lined fitted case. All mounted as worn. Lt Col Tupper entered the army as an Ensign 1854, serving in the Crimea at the siege and fall of Sebastopol (severely wounded at the attack on The Redan 8 September 1855), present during the Indian Mutiny and the relief and capture of Lucknow, the defeat of the Gwalior contingent at Cawnpore and operations including the affair at Ramgunga and the driving of the rebels from Oude into Nepal (Mentioned in Despatches); Captain 1859, Brevet Major 1872, embarked for the Gold Coast and served in the second phase of the Ashanti War 1873 (awarded Brevet Lt. Colonency). With a quantity of research including copy letters from Tupper’s father to the Duke of Wellington requesting the purchase of a commission for his son (mostly by Judith Farrington) including obituary from The Times 1881. Ex Alec A. Purves Collection. 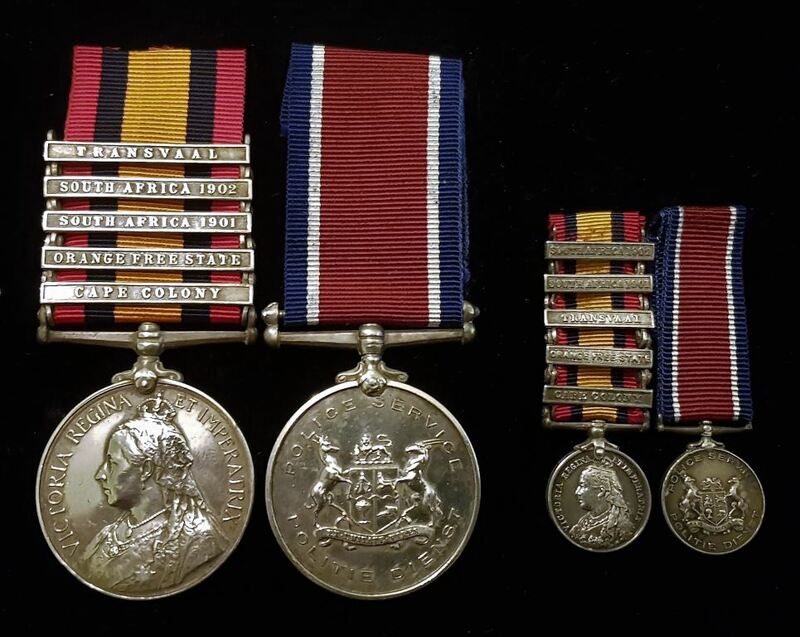 Value point: Good early to mid Victorian officer’s group contained in the original fitted medal case with miniatures and both groups mounted as worn. Egypt and Sudan 1882-89, dated reverse, 5 clasps, Tel-El-Kebir, Suakin 1884, El-Teb-Tamaai, The Nile 1884-85, Kirbekan (2789 Gunr. E. Cornish, G/B. R.H.A. ); Khedive’s Star, 1882, contact marks, otherwise generally very fine. Harry John Cornish was born in Waltham Cross, Hertfordshire, in about August 1860, and enlisted in the 7th Hussars at Dublin in March 1881. Transferring to the 19th Hussars in July 1882, he quickly witnessed active service, being present at Tel-el-Kebir, El-Teb-Tamaai and Suakin, it appears that he may not have been present in the Nile Expedition or at Abu Klea? He contracted dysentery and was invalided home on the Seraphis in early 1886 (1 year after Abu Klea) and was admitted to Netley Hospital on arrival, he was discharged in consequence of his having been found medically unfit for further service’ in June 1886. Ernest Cornish, Harry’s brother, was born in about February 1859, and enlisted in the Royal Horse Artillery in July 1877. Having then served in India, he transferred to ‘G’ Battery, R.H.A., and was present at Tel-el-Kebir. Then in November 1883, he transferred to the 19th Hussars, in order to be with his brother, and it was in this capacity that he was present at Suakin and El-Teb-Tamaai, in addition to the Nile Expedition and Kirbekan. He was placed on the Army Reserve in January 1887. Please note that both medals have perfect carriage work for the five clasps and have not been altered. Group of five: NWF of India 1908 Distinguished Conduct Medal (EDVII), IGS 1854 three clasps "Burma 1885-87, Sikkim 1888, Samana 1891 "(Gunner No 9 By 1st Bde N Dn RA); IGS 1895 three clasps " Relief of Chitral 1895, PF 1897-98, Tirah !897-98 "(Corpl. No3 Mtn By RA); IGS 1908 one clasp "NWF 1908" (Sjt. No 3 Mtn B RA); Army LSGC Medal (EDVII) to Sgt. J. Charlton RGA. Some contact marks otherwise generally very fine, with copied original Recommendations and service papers. DCM LG 12.8.1908: Sergeant John Charlton, Royal Garrison Artillery. For operations against Zakka Khel and Mohmands; Army Order No 252 of October 1908. M.I.D. LG 22.5.1908 Sergeant Charlton’s name appears in Appendix A of Major General Willock’s despatches for operations of the Bazar Valley Frontier Force 13th February – 2nd March 1908. Only 9 DCMs awarded for the NWF 1908 campaign. 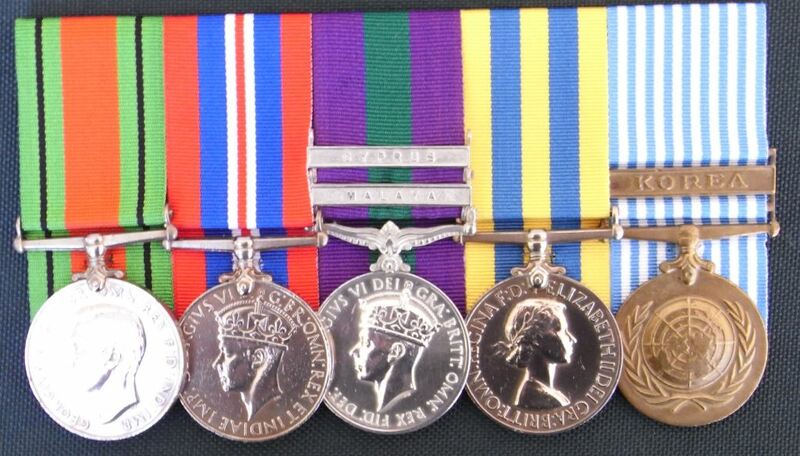 Value point: Unique to the RA and an extremely rare combination of IGS campaign medals/clasps to a British Army Other Rank having served an incredible 30 years continuously in NW India. Single : Waterloo Medal impressed to JOHN GRANT , ROYAL ARTILL. DRIVERS. John Grant served in Major N. Turner's A. Troop and is confirmed on the roll. Split ring and steel clip suspension. MC engraved "Cyril E.W.Birkett, Givenchy, March 10th 1915, 60th Rifles", Trio correctly impressed : Star 2nd Lt. Somerset L.I.. BWM & VM Capt.. DM & WM un named as issued. MC London Gazette 23 June 1915 - attached 1st Battalion King's Royal Rifle Corps. Birkett also served in the post WW1 Iraq army terminating in 1926 and during a period where no campaign medal was issued. Although originally Som.L.I. Birkett was attached to K R R C for the duration of the war and in Iraq finally retiring in 1946. A superb early 1915 Gallantry group to a very popular Regiment. Purchased direct from the family. 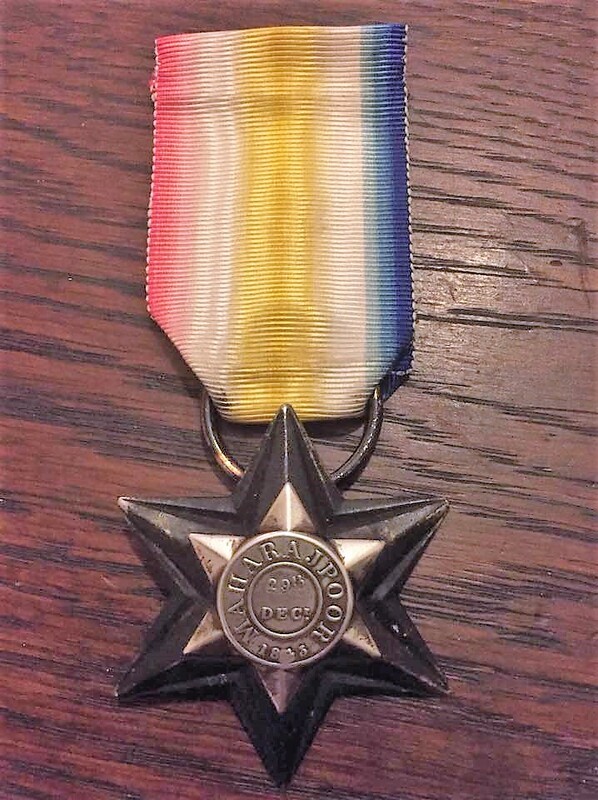 Family Group : Group one; Military Medal, 1914/15 star, British War Medal and Victory Medal all correctly impressed to S-8520 CPL W. Gerard GORD. HIGHRS. Lond. Gaz. 16th November 1916. Comes with his dog tag bracelet and medal card box. 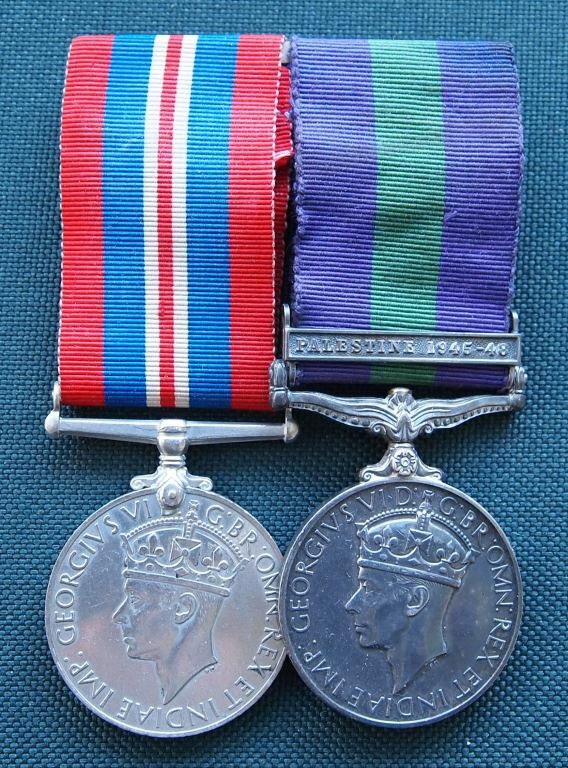 Group two; British War Medal and Victory Medal correctly impressed to 350946 PTE. A. Gerard R. SCOTS. Comes with medal card box. Fantastic Scottish family grouping with the last group belonging to the brother-in-law. 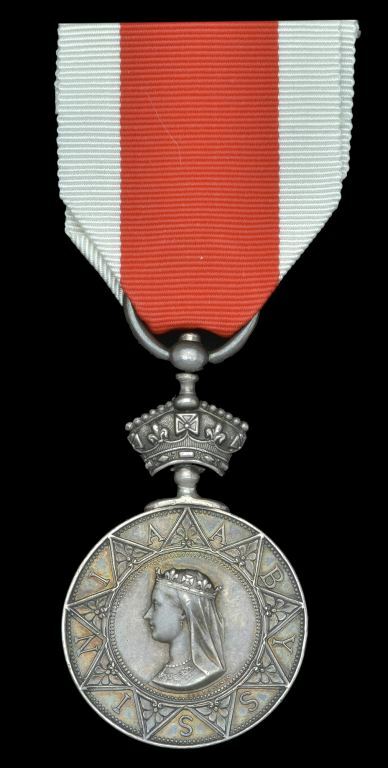 Single : Medal of the Order of the British Empire (civil) in the box of issue. Instituted in June 1917 with less than 2000 medals awarded before they were discontinued in 1922. Pair : EGYPT MEDAL undated two clasps " Suakin1885, Tofrek" 259 Pte.M. BALLARD. 1/RL. 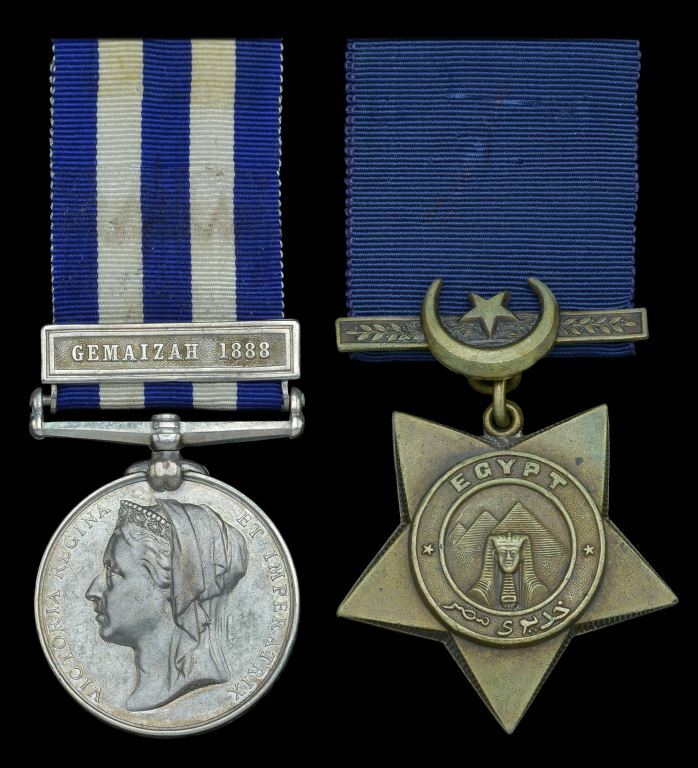 BERKS R. KHEDIVE STAR dated 1884-6 stamped "BERKS" and "259"
Single : EAST & CENTRAL AFRICA MEDAL one clasp "Uganda 1897-98" engraved 1557 Pte Jaffa Khan 27/ Bo:L.Inf. Single : CRIMEA MEDAL1854 no clasp period engraved BENJN CHURCH , CAPTNS STEWARD, HMS ALBION. Comes with attractive locket belonging to Church's first wife Elizabeth, containing a small portrait of him and his daughter. He served as Steward to Captain (later rear admiral) Stephen Lushington Commander of the Naval Brigade at Sebastopol. Also with six copied letters written by Lushington to Church, which make interesting reading and provide some background to life on campaign in this period. Includes a number of copies of family photos and research. Single : CRIMEA MEDAL1854 one clasp "Sebastopol" engraved 3272 Andrew Robertson, 71st Highland Lt.Infy. 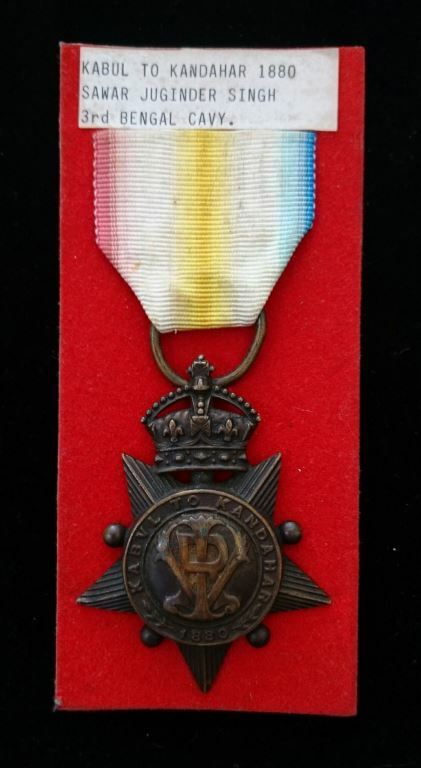 Single : HANOVERIAN WATERLOO 1815 Medal impressed Corporal Jopst' Heinr Kracke, Landwehr Bat. Nienburg. Single : ARMY OF INDIA MEDAL one clasp "Bhurtpoor" impressed Drummer J.Gee 59th Foot. Short hyphen & WW type. The 59th were part of the main storming of this major fortification being the gateway to the East. Single : CHINA WAR MEDAL 1857-1860 two clasps "Taku Forts 1860 Pekin 1860" impressed Pte Josph.Goodchild. 1st Dragoon Guards. This was the only British Cavalry unit to recieve this medal and as such is scarce. Single : NEW ZEALAND MEDAL dated " 1860 - 65 "impressed 198 George Jefferies 65th Foot. Single AFGHANISTAN MEDAL 1878 0ne clasp " Ali Musjid" engraved 27B/60 Pte C.Gammon 1/17th Regt. Single : CANADA GENERAL SERVICE MEDAL one clasp " Fenian Raid 1866" impressed 1567 Dr. E.Newberry, 4th Bde. R.A. This medal is not common to British Troops. Pair : EGYPT & SUDAN 1882-89 dated reverse no clasp 2685 Pte.W.Simmonds. 2nd Bn. Derbyshire Rgt. KHEDIVE SUDAN dated 1882. very neatly engraved with full details of recipient. 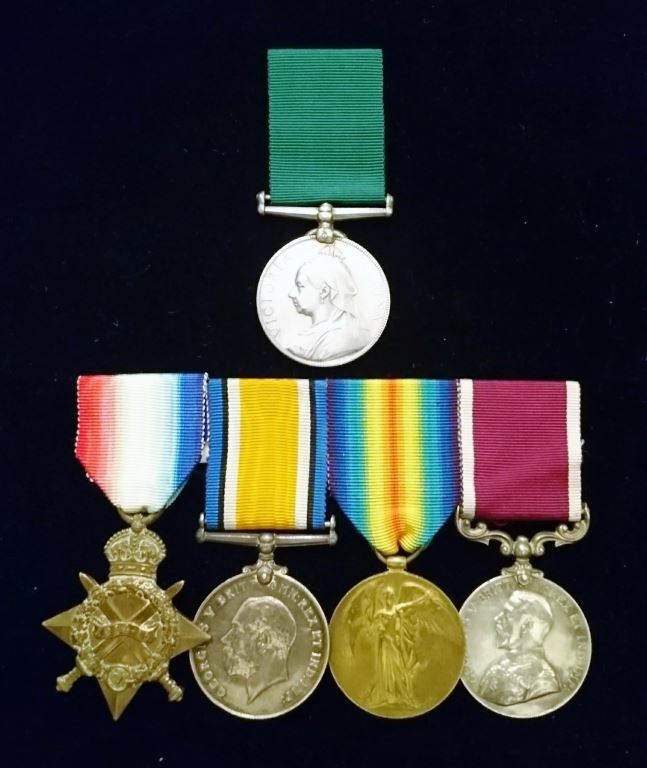 Trio: 1914/15 Star, British War Medal and Victory Medal impressed to 411 PTE. A. J. MIELL. R. FUS. Pair: GSM One Clasp; "Cyprus" and CSM One Clasp; "South Arabia" correctly impressed to 23531132 SPR - CPL R. S. Torode R.E. Single: CSM two Clasps; "South Arabia, Radfan" correctly impressed to 23866608 TPR. W. J. DAVIES . 16/5 L.
Single: CSM clasp; "South Arabia" correctly impressed to 23959252 RFN. D. A. McI. BOGAN. CAMERONIANS. Note. This was the Cameronians last campaign before disbanding. The Cameronians chose to disband rather than amalgamate with another regiment in the Lowland Brigade. Pair: CSM Two Clasps; "Malay Peninsula, Borneo" and United Nations medal Cyprus. Correctly impressed to 24033739 RFN F. A. E. Therton. 3 Green Jackets. Family grouping. Father and Son. 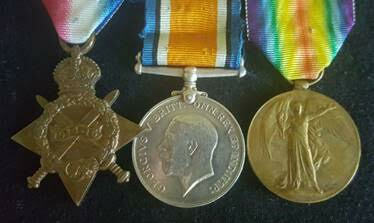 Trio: 1914/15 Star, British War Medal and Victory Medal impressed to 87841 DVR. 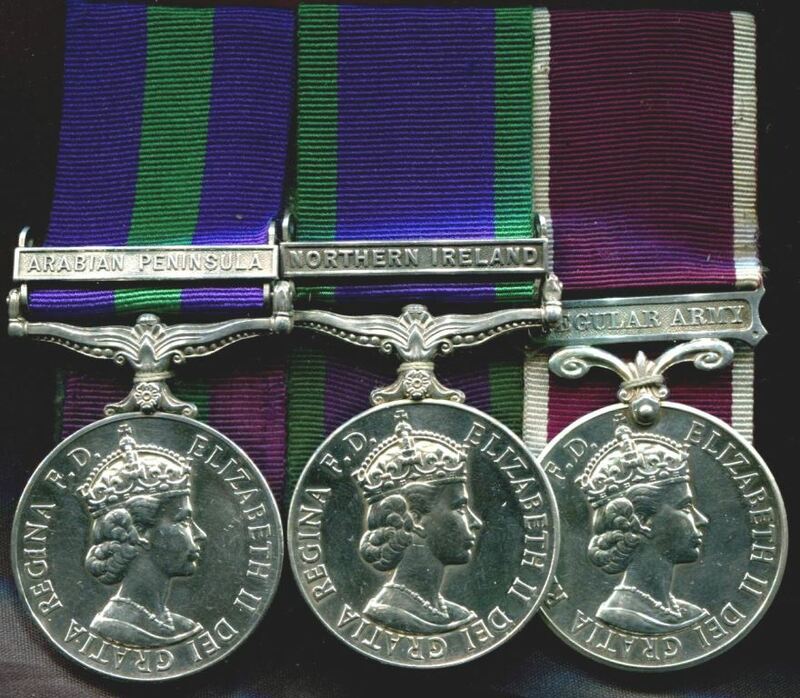 J. FRENCH R.A.
Trio: Queens Korea Medal, United Nation Korea medal and CSM clasp "NORTHERN IRELAND". Queens Korea Medal impressed to 22274310 SPR. E. J. FRENCH R.E. UN Korea is unnamed as issued with the CSM impressed 22274310 SGT. E. J. FRENCH QUEENS. Unusual grouping which includes Korea and Northern Ireland. Comes with regimental cap badges. Single : CRIMEA MEDAL1854 one clasp "Alma" officially impressed W.Mashall 42nd Regt.. Pair: CSM One Clasp; "Northern Ireland" and United Nations medal Cyprus. Correctly impressed to 24187986 Pte R. J. Desborough PARA. Three: Crimea 1854-56, 3 clasps, "Balaklava, Inkermann, and Sebastopol" officially impressed to E. Quinn. 6th Dragoons, Army L.S. & G.C., V.R., small letter reverse to 955. Edwd. Quinn. 11th Hussars; Turkish Crimea 1855, Sardinian issue in contemporary running script to 957 E. Quinn, 6th Dragoons. Edward Quinn was born in County Donegal and attested for the 6th Dragoons at Enniskillen on 3 October 1846, aged 20 years. He is shown in the muster rolls as being on active duty with his regiment for the whole of the quarter dating 1st October to the 31st December 1854, and it is most probable, therefore, that he took part in the famous charge of the Heavy Brigade at Balaklava. Medal roll states "Invalided home 15 Sept 1855". He transferred to the 11th Hussars on 1 November 1866 and was discharged from the service on 1 November 1870. Sold with copied discharge papers. Single: INDIA GENERAL SERVICE MEDAL1854 One Clasp; "PEGU" CPL. W. Wheeldon 18th Royal Irish RGT. Impressed naming. Converted to menu holder fully HM Birmingham 1898. Fortunately the silver stand is attached to the inside of the clasp ends, having almost no effect on the medal itself. An interesting Medal. 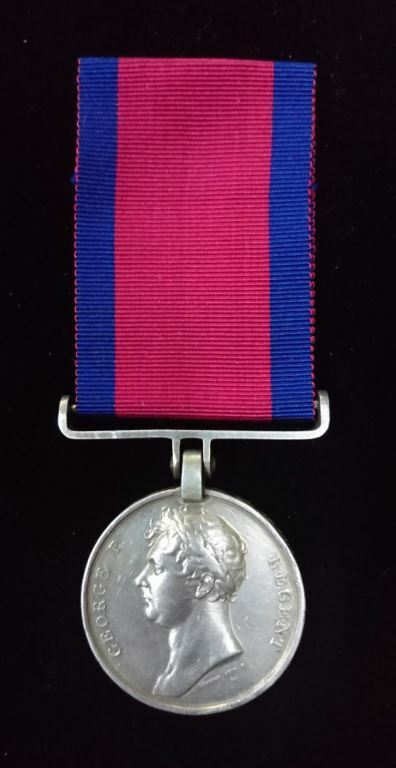 Single: Indian Mutiny Medal 1857-58 one clasp "DELHI" impressed naming to CORPL S. COTTERILL 52ND L. I.
Medal confirmed on service record as Samuel Cotterill. Record also shows service in the East Indies as 8 years 7/12 months (no further medal). Single: Iraq war medal correctly named to 25149862 PTE G. P. D. Dawson RAMC. With original oath of allegiance, Course Certificate, Box of issue and a group course photo. Pte. Dawson was a combat medic in Iraq. 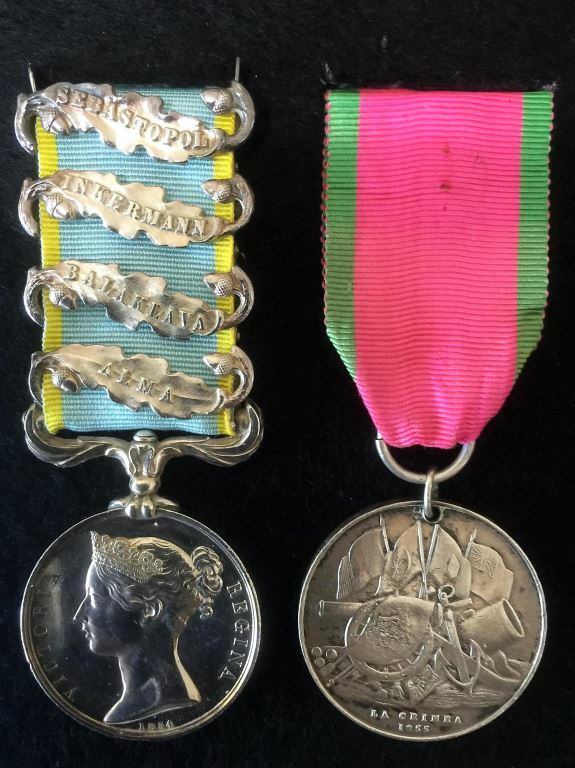 Pair: Crimea Medal three clasps "ALMA, INKERMANN & SEBASTOPOL" and China Medal 1857. Crimea period engraved T. EWEN 8TH COY R*S*M, China Medal impressed CORPL THOS EWEN. 23RD C. ROYAL ENGRS. This pair is ex a very old Australian collection and thanks to the modern ability to research has turned into a great story of Crimean heroism. In a NSW newspaper article dated 14th July 1900 we have found a brief article on the Victoria Cross that Sapper Ewen "never wore, though he won." The official history mentions Sapper Ewens bravery on a number of occasions including along side Colour Sgt Henry McDonald when he earns his Victoria Cross. It is interesting to note that years after the event General Gordon (of Khartoum fame) was still campaigning to have Ewen recognized for his gallantry. Single: Crimea 1854-56, 4 clasps, "Alma, Balaklava, Inkermann, and Sebastopol" correctly impressed to G. Alcock, Grenadier Gds. 3420 Private George Alcock ('Allcock' in the published roll), 3rd Battalion Grenadier Guards was severely wounded at the battle of Inkermann, 5 November 1854. On a later roll he is listed as ‘Dead W.O. 29.4.56'. As Private Alcock was classed as "Severely wounded" one can only guess that his death was a result of his wounding. The Russian force of no less than 7,000 men attacked the Sandbag Battery bravely defended by 2,000 men. A rare casualty medal to such a significant action. 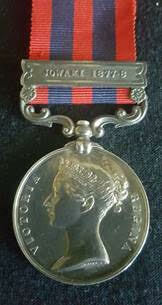 Single : AFGHANISTAN MEDAL 1878 one clasp "Charasia" engraved 1973 Corpl.C Baillee 92nd Highrs. John Paris Duguid first appears in WW1 on the R.A.M,C Special List at the rank of Lieutenant in October 1915. Serving all through WW1 up until the early 1920’s including service in Iraq and India, discharging at the rank of Captain. Post war Captain Duguid travelled, visiting and living in several places including Australia and America. At home for the outbreak of WW2, Captain Duguid re-enlisted for home service. Reaching the rank of Colonel by the end of hostilities and he further continued to serve post war in a reserve role. Group of Five: GSM (GV1) One Clasp; "PALESTINE” correctly impressed to 3908856 PTE W. GETHIN S. WALES BORD. 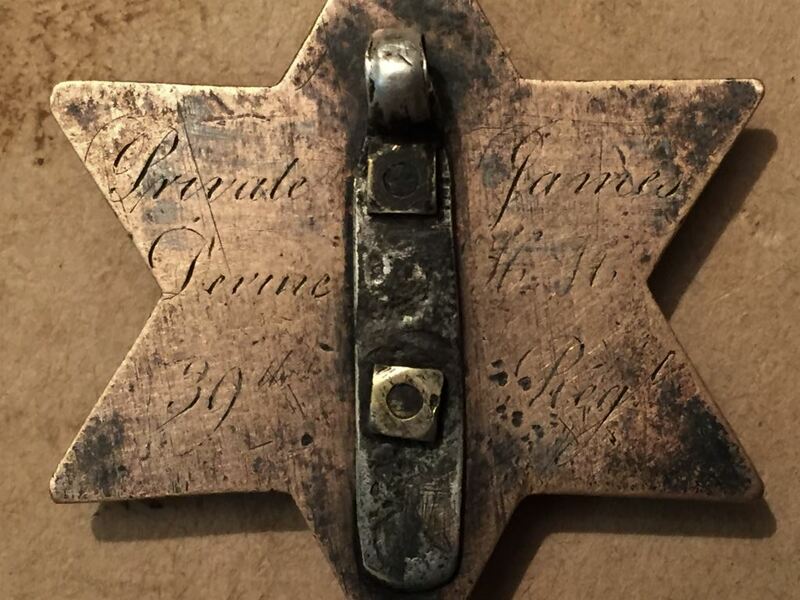 1939/1945 Star, Africa Star, Defence and War Medal unnamed as issued. Note: The 1st battalion, South Wales Borderers were posted to Iraq in November 1941 in anticipation of a German attack. When it became apparent that no such attack was coming, they moved overland the following May to a position just outside Tobruk, which they were ordered to hold in cover of the general British withdrawal of forces from the area. This order, however, was almost immediately countermanded and a chaotic retreat ensued, exacerbated by lack of transport and the capture of the battalion’s reconnaissance officers by the Germans. Under heavy attack, and in unfamiliar and hostile terrain, over 500 men were lost, most taken prisoner. Originally classed as missing in action and re-classified as Prisoner of War (Germany). Lance Corporal Gethin was prisoner number 6384 at Stalag 317, Sankt Johann im Pongau, Austria. Stalag 317 initially consisted of prisoners from France and the Soviet Union who were used as forced labour in nearby factories and in agriculture. In November 1943, after the Italian armistice, Commonwealth prisoners arrived from Italy with two hundred NCOs being transferred. Records state approximately 4,000 people died in the camp and indicates that most were Soviet Prisoners. 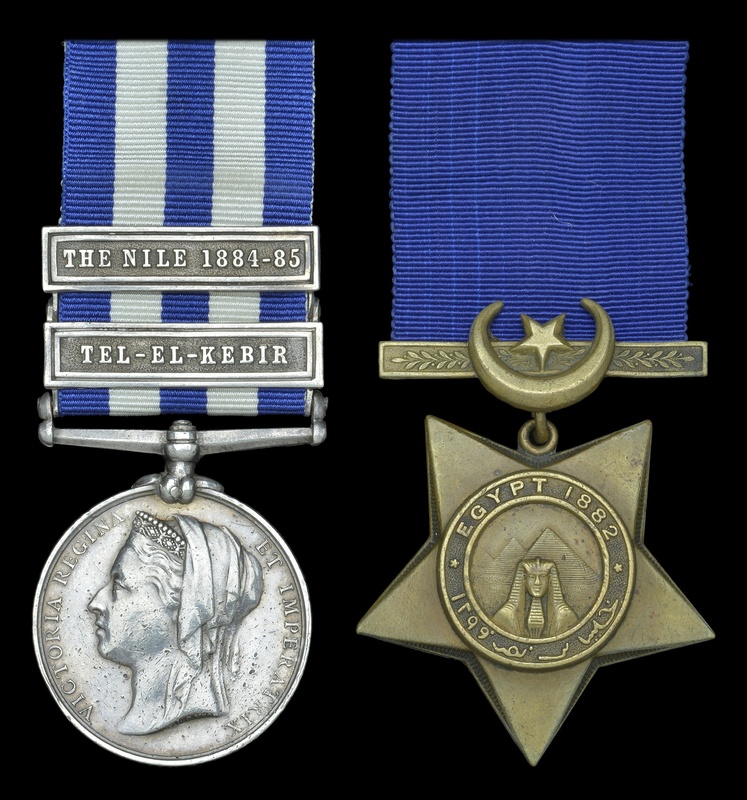 Single: Egypt Medal (undated) three clasps: "TAMAAI, THE NILE 1884-85 & KIRBEKAN" correct period engraved naming to 2452 PTE D. KENEALY 19th HUSSARS. Note: believed only three members of the 19th Hussars entitled to this combination. 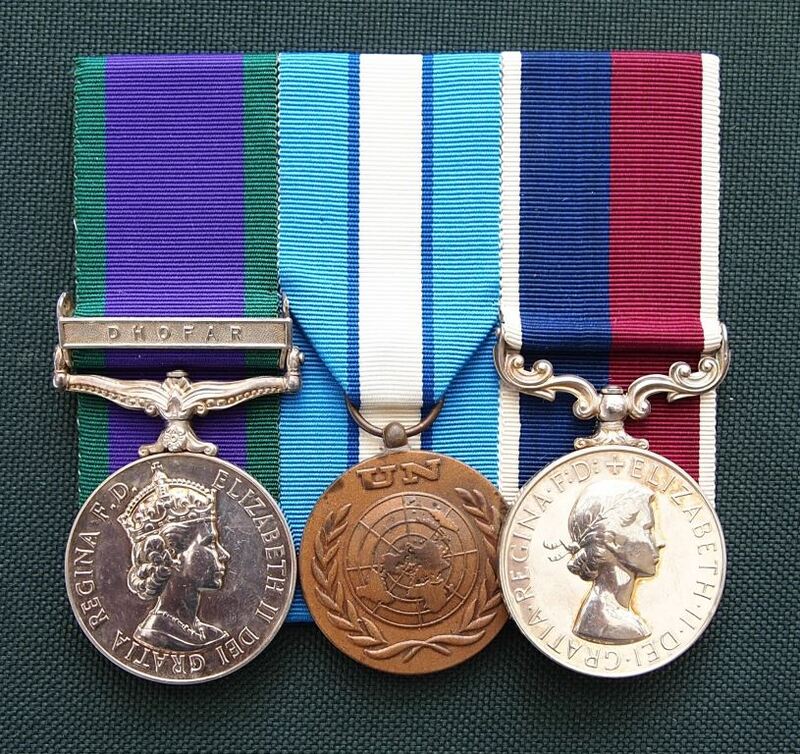 Group of four : MILITARY CROSS G.V.R. British War & Victory Medals plus "Mayor of Exeter" Key 1933. MC engraved " 8th Sept 1916, Kenneth Gatey, Devon Regt" Pair impressed Lieut. Temp.2nd Lieut. Kenneth Gatey, Devon Rgt. "For conspicuous gallantry during a raid.When hung up by the enemy's wire he deliberately cut it, aided by a corporal and a lance corporal, and, entering the enemy's trenches, accounted for several enemy and took a prisoner." " Southern Railway Exeter Central - New Station opened by - The Mayor of Exeter Kenneth Gatey Esq. MC. 1st July 1933." Key is HM Silver Birmingham 1932 and is lightly gilded. Purchased direct from the family. Single: South Africa Medal 1834-53 impressed to GUNR & DR J. MALONE RL. ARTY. 1914-15 Star (M.13701 Act. E.R.A.4, R.N. ); British War and Victory Medals (M.13701 E.R.A.3, R.N. ); Royal Navy L.S. & G.C., 2nd issue (M13701 E.R.A.1, H.M.S. Acasta) some edge bruising and contact marks, fine and better. Note; Cyril McCarthy was born in Birmingham on 19 January 1891. An Engine Fitter & Turner by occupation, he entered the Royal Navy in June 1915. During the war he served on Argyll, July 1915-December 1915; Vivid and Victory, December 1915-February 1917; Circe, February-July 1917; Bellona, September 1917-March 1918 and M.B.037, July 1918-June 1919. He attained the rank of E.R.A. 1st Class in 1927. With copied service paper. Single : CRIMEA MEDAL1854 one clasp "Sebastopol" engraved Thos.Parr Grenr.Guards.. Pair: India General Service Medal one clasp: "CHIN-LUSHAI 1889-90" , running script 3359 Pte. T. Baker 1st Bn. K.O.SCO. 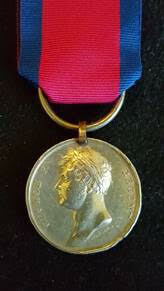 B. Queens South Africa Medal three clasps : "C.C., P'Burg, Jo'Burg" impressed 3359 Pte. T. Baker. K.O. SCOT. BORD. 6. Small photo of recipient. The Roll Call: Grenadier Guards, after the Battle of Inkerman by Lady Butler. Single: Crimea Medal four clasps "Alma, Balaklava, Inkermann, Sebastopol" impressed naming to C. HATTER. GRENADIER GDS. A great double wounding medal to a true fighting soldier who succumbed to his wounds only weeks after the famous "Sandbag action". 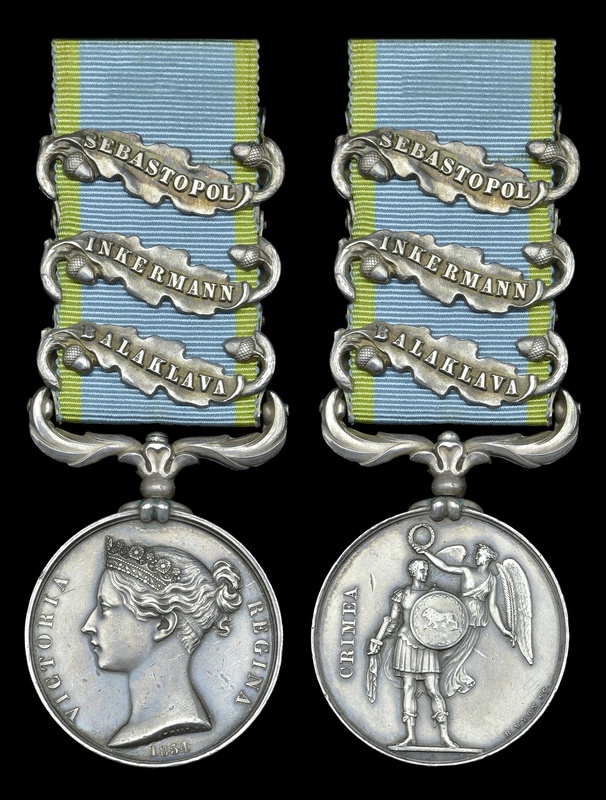 Pair : Crimea Medal three clasps "Balaklava, Inkermann, Sebastopol" and Turkish Crimea (Sardinian issue). Crimea medal impressed F. GRAY. 2ND DRAGNS. Sardinian Crimea depot impressed in upright capitals F. GRAY 2ND DRAGOONS. 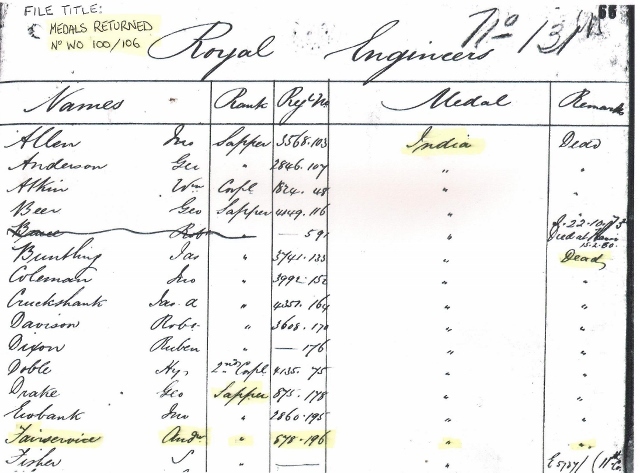 Confirmed on roll and records show that at no stage was Private Francis Gray sick during the Crimean war. His service being stated as 1 year and eleven months in the Crimea. Roy Duttons book "Forgotten Heroes" has 1099 Pte. Gray as "probably rode in the charge". Great group to Gray of the Grey's. IMPORTANT NOTICE: The book "Charge of the Heavy Brigade" by Roy Dutton on page 359 reproduces an article by "the Aberdeen weekly" October the 27th 1896 which reports on the Scots Greys annual reunion in which Troopers W. Swanson, Gray and Berland are guests of honour being original chargers. This clearly illustrates that Gray being the only trooper on the nominal roll can now be classed as a "confirmed charger". 1914-15 Star (14516 SJT T. McCONVILLE. R. IR. FUS); British War (14516 SJT T. McCONVILLE. R. IR. FUS); VICTORY MEDAL (14516 SJT C. McCONVILLE. R. IR. FUS); Meritorious Service Medal, G.V.R., 1st issue (14516 C.Q.M. SJT T. McCONVILLE 9/R. IR. FUS). There is a minor initial error on the Victory Medal, but all surrounding information including service number is the same. M.S.M. London Gazette 18 January 1919. Thomas McConville was born on the 9th August 1895 in Co. Armagh, Northern Ireland and enlisted with the Royal Irish Fusiliers in 1915, serving with the 9th Battalion (Lurgan) during the Great War. A Genealogy extract on Lurgan has his final rank as Regimental Quartermaster showing the following “McConville, Thomas, 120, Victoria Street, R.Q.M.S., 9th R.I.F., M.S.M”. He and his wife along with their baby daughter migrated to Australia in 1926. 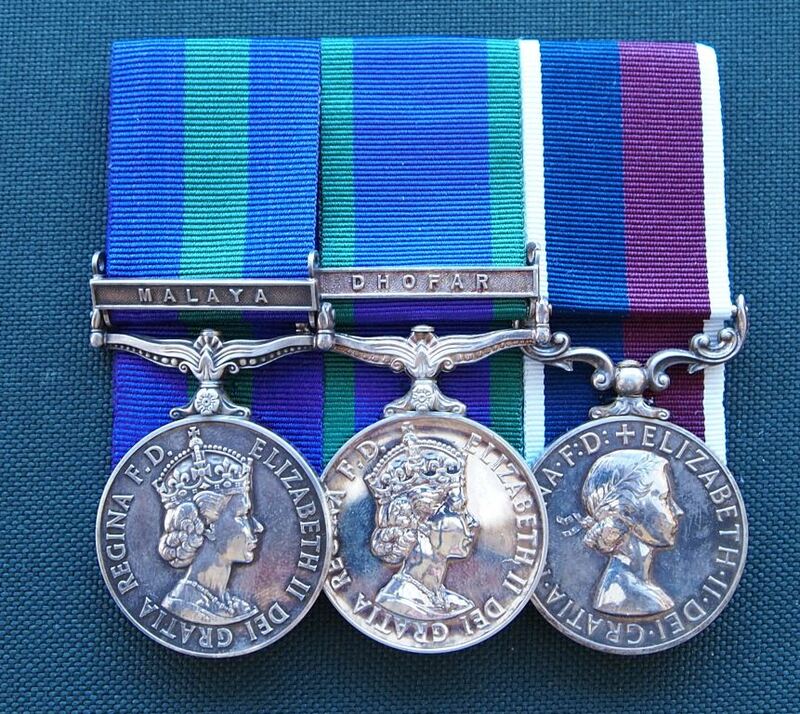 Trio : Distinguished Conduct Medal (VR), Crimea Medal four clasps "Alma, Balaklava, Inkermann, Sebastopol" and Turkish Crimea (British issue). DCM impressed CORPL G. THOMSON. SCOTS FUSR GDS. Crimea Medal contemporary engraved capitals CORPL GEOE THOMPSON SCOTS FUSR GDE. Turkish Crimea in upright engraved capitals SGT G. THOMPSON (unofficial Crimea suspension). Note: the DCM has omitted the "P" in Thompson. Period records show that Sgt.Thompson was recommended on the 26th March 1855 by the Officer Commanding the Royal Scots Fusilier Guards "Under the Warrant of 4th December 1854" for "Distinguished conduct in the field". The medal was sent to the Adjutant General in the Crimea on the 14th May 1855 for issue in the field. The Scots Guards were awarded four Victoria Crosses and a number of Distinguished Conduct Medals in Heavy fighting in the Alma and Inkermann. As this DCM was awarded prior to the creation of the Victoria Cross and was issued in country, there is unfortunately no citation. One thing is for sure he would have been involved in several bayonet charges and a good deal of bloody hand to hand fighting. It even raises the question whether the original DCM winners would have been eligible for the Victoria Cross if it had been instituted at the time. Single: Waterloo Medal 1815 correctly named to William Cooksey, 23rd Reg. Light Dragoons fitted with original steel clip and later ring suspension. 23rd Light Dragoon casualties at Waterloo; 13 men killed, 5 officers & 23 men wounded, 1 officer & 31 men missing. Served in Captain John Martin's number 2 troop. Ex Gascoigne collection March 1909. Originally sold by Sotheby, Wilkinson & Hodge February 1879 and later again sold by Spink's (c1995) of where it has resided in a collection ever since. 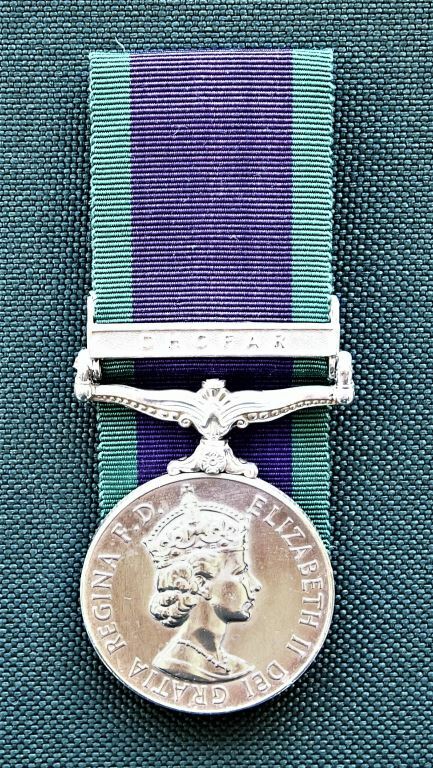 Pair: Distinguished Conduct Medal (VR) and Crimea Medal clasp "Sebastopol". DCM impressed ANDREW FAIRSERVICE SAPPERS & MINERS. Crimea Medal contemporary engraved capitals A. FAIRSERVICE R.E. "Among those who were the most praised was private Andrew Fairservice. He is stated to have been exceedingly active in repairing embrasures under heavy fire, so much so, indeed, that his valour and perseverance gained him the honour of a Distinguished service medal and gratuity of five pounds." 878 Sapper Andrew Fairservice ..... "Died from the effects of a gunpowder explosion. The officer and men were at the time engaged in removing the powder from several carts of ammunition which were abandoned by the enemy while retreating before the column, and throwing into a well." Records show (see illustration) that his Mutiny Medal was returned by his unit due to the fact that he was killed. As this medal was not claimed, this group can not be classed as a broken group. 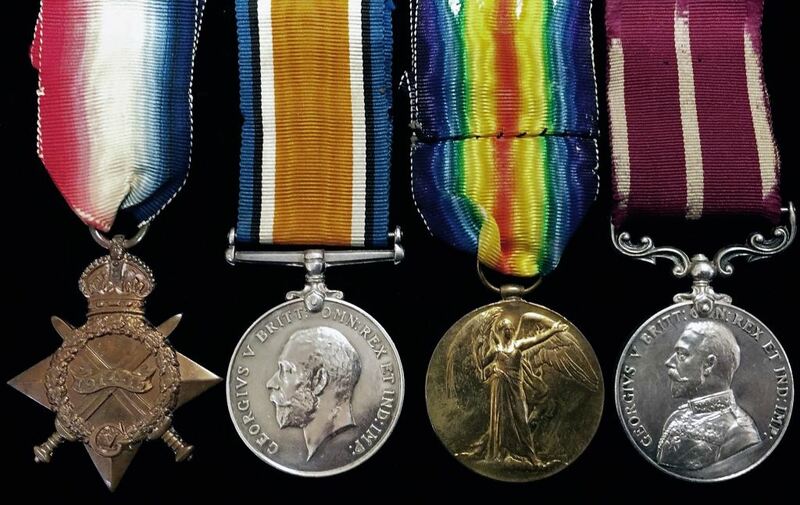 Close examination of the medals suggest both retain their original ribbon and could be classed as "sleepers". There is no doubt that these sappers did tremendous work at Sebastopol under horrendous conditions constantly exposing themselves to enemy fire. Henry Wallace was born in 1844 and attested for the 60th Regiment of Foot (King’s Royal Rifle Corps) at the Regimental Headquarters in Winchester on 26 September 1864. He served with the 2nd Battalion in India from 1 November 1867, on garrison duty at various stations within India, and was promoted Corporal, before moving into Afghanistan as part of the Kandahar Field Force in 1878. 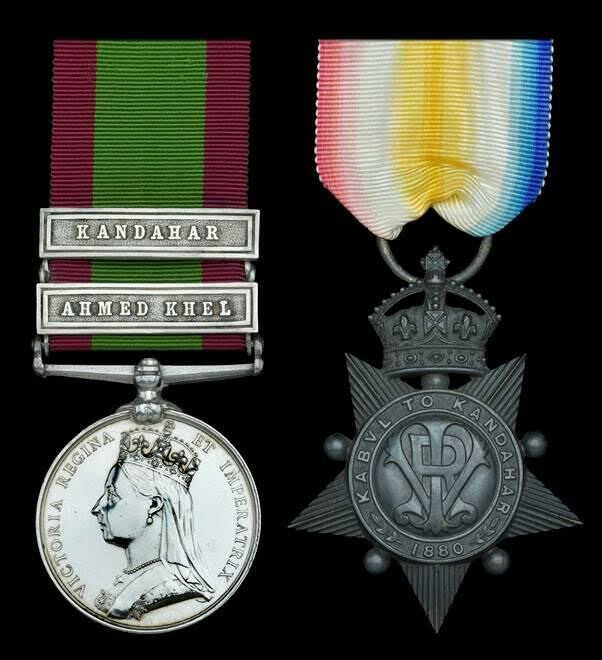 He served throughout the Second Afghan War, and was present at the Battle of Ahmed Khel, 19 April 1880, and took part in General Roberts’ celebrated 310-mile march from Kabul to relieve Kandahar, defeating the Afghans under Ayub Khan on 1 September 1880. Promoted Lance-Sergeant, the Medal rolls for both awards list him as ‘Dead’. Six: An interesting low level flying fighter pilot Distinguished Flying Cross (dated 1943) & Bar (engraved 1944), 1939/45 Star, Air Crew Europe "France and Germany", Defence Medal, War Medal and 1953 Coronation medal. Attributed to 106182 Flight Lieutenant Michael John Gray of 168 & 2 Squadron. D.F.C. correctly period dated 1943 and Bar 1944 respectively. Campaign medals unnamed as issued. "Act. Flt. Lt. M. J. Gray. R.A.F.V.R., No, 168 Sqn. This officer is a fine leader and a courageous pilot, who has completed many long-range reconnaissance in single-seater fighters. During sorties in search of enemy shipping along the Dutch coast he has located and reported accurately the position of numerous convoys. Flt. Lt. Gray has damaged eight enemy vessels and nine locomotives. No aircraft has been lost from any formation led by him. On a recent sortie he flew low through the streets of Ostend in the face of intense anti-aircraft fire." "Acting Squadron Leader Michael John Gray, D.F.C., (106182), R.A.F.V.R., 2 Sqn. This officer has displayed outstanding ability and zeal. He is a gallant and forceful leader, whose personal example has contributed materially to the high standard of efficiency of the squadron which has obtained much access. He has commanded the squadron for some nine months during which period the formation has completed many sorties, involving reconnaissance and attack on radio buildings and flying bomb sites. Squadron Leader Gray has taken part in many of these assignments." Comes with two original flight photographs possibly low level flying through Ostend, Coronation certificate from Buckingham Palace named to Flt. Lt. Gray, period newspaper cut outs from a scrap book with hand written notes, Original London Gazette for the Bar to the DFC and congratulation letter on his DFC from Group Captain Geddes dated 1943. Pair: South Africa 1877-79, 1 clasp, “1879 “ 8146, SERGT. J. McDONALD, R. E. Army L.S. & G.C., V.R. 8146. CD. SGT. MAJ: E. J McDONALD, R. E.
Single: Kabul to Kandahar Star 1880 Sowar Juginder Singh, 3rd Bengal Cavy. Single : Naval General Service Medal 1793-1840 with one clasp "Guadaloupe" impressed naming to JOHN HAZELDINE. John Hazeldine is confirmed on the roll as a Private in the Royal Marines on the ship Alcmeme. Single: INDIA GENERAL SERVICE MEDAL1854 One Clasp; "Burma 1885-7". Native 1st Bombay Lancers. Bronze Issue. Pair : AFGHANISTAN MEDAL three clasps " Charasia,Kabul,Kandahar; engraved 1886 Pte. D.McLelland, 92nd Highrs. KABUL TO KANDAHAR STAR impressed. Single: India General Service 1908-35 (GV), 1 clasp, ”MALABAR 1921-22 “ LT. G. W. NUNN, 1-39 GARH RFLS. SSM alexander Gerard 10th Hussars, (seated) Curragh 1896. Trio : Egypt 1882 undated, two clasps ; "EL-TEB_TAMAAI, THE NILE 1884-85", Queen South Africa medal 1899 seven clasps "R of K, Paard, Dreif, Jo'Burg, D.Hill, Witt, SA01" and Khedive Star dated 1884-6. Egypt medal engraved in 10th Hussars style (see footnote) 1572 PTE A. GERRARD 10TH RL. HUSSARS (note; two "R's" in Gerrard). QSA CORRECTLY IMPRESSED 1572 SQ: S. MAJOR. A. GERARD. 10TH HUSSARS. Khedive star unnamed as issued. Footnote: "Send one officer to London to pick up (c. 300) Egypt Medals for your regiment, to be named regimentally in time for Prince of Wales' inspection of the regiment at Shorncliffe" (Ref. Royal Mint Letter, dated 17 June 1884, to Colonel Wood, C/O 10th Hussars). John Halpin was born 1822 in Limerick, Tipperary, Ireland joining the 74th Regiment (number 1766) on the 22nd February 1840, at the age of 18. John saw service in the 3rd Kaffir war of 1850-53 with his unit the 74th Highland Regiment. In 1864 after 20 years of service and in receipt of a pension he migrated to Sydney NSW along with his five children on board “The Queen of the East”. His wife was not aboard but was noted as already living in the colony; John’s occupation was listed as Shoemaker and soldier. Group of six : QSA five clasps " CC,OFS,T SA 01,SA 02" (K.R.R.C) top two clasps loose. 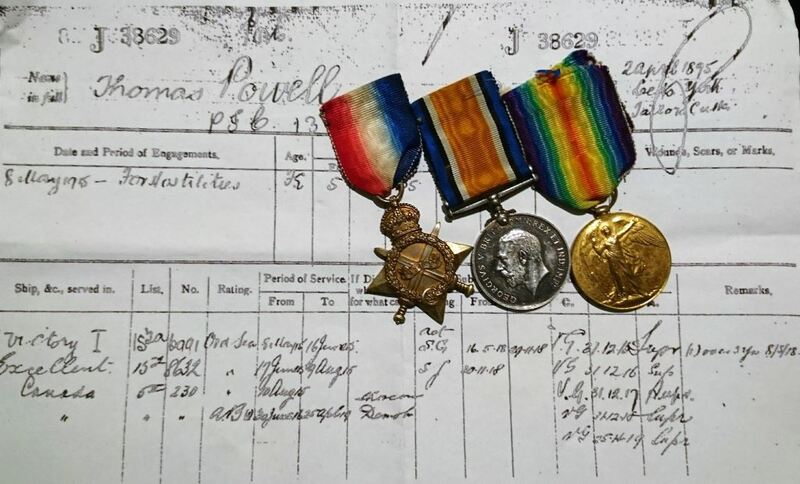 1914 -15 STAR, BRITISH WAR & VICTORY MEDALS impressed 2387 Pte/Sgt T. Rogers K.R.R.C. 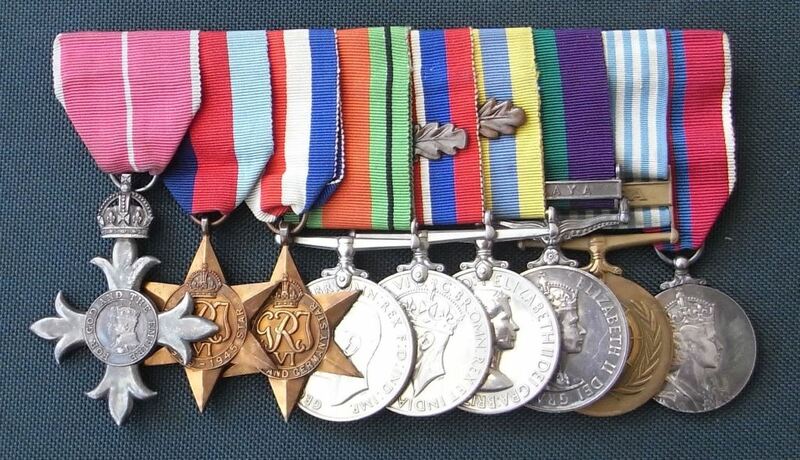 1939 WAR & AUST.SERVICE MEDALS impressed W243298 T.Rogers. A nice rare Boer War to WW2 group with his final period still being active service in the 18 Maint. Platoon RAE, Western Australia. Single : Commander of the British Empire. 1st type (Military Division). Cased. Single : Associate Royal Red Cross G.V.R. Cased. Single : Imperial Service Medal 1st Type (Star shaped). E.VII.R. Correct period engraving to JOSEPH STONEBRIDGE. London Gazette 05/07/1910. Principal Warder, Durham Prison.